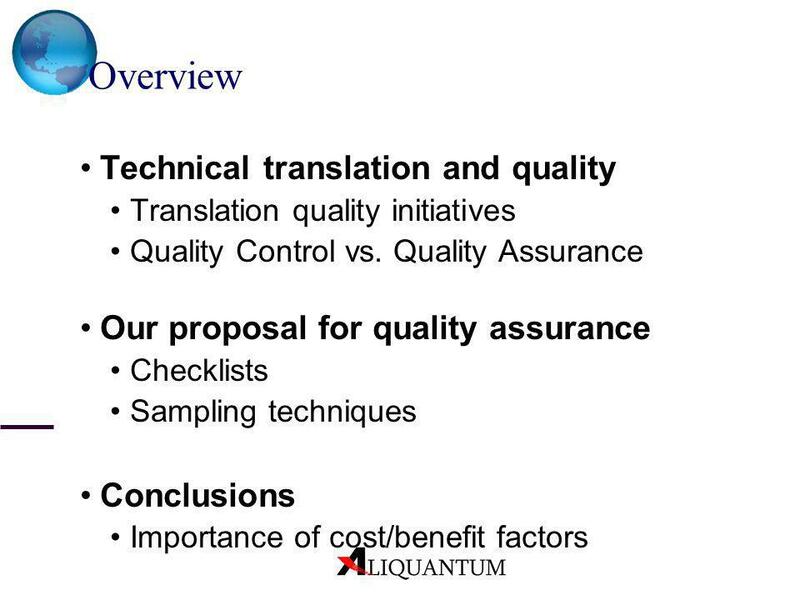 Translation quality initiatives Quality Control vs. Quality Assurance Our proposal for quality assurance Checklists Sampling techniques Conclusions Importance of cost/benefit factors We shall deal here exclusively with technical or commercial translation. 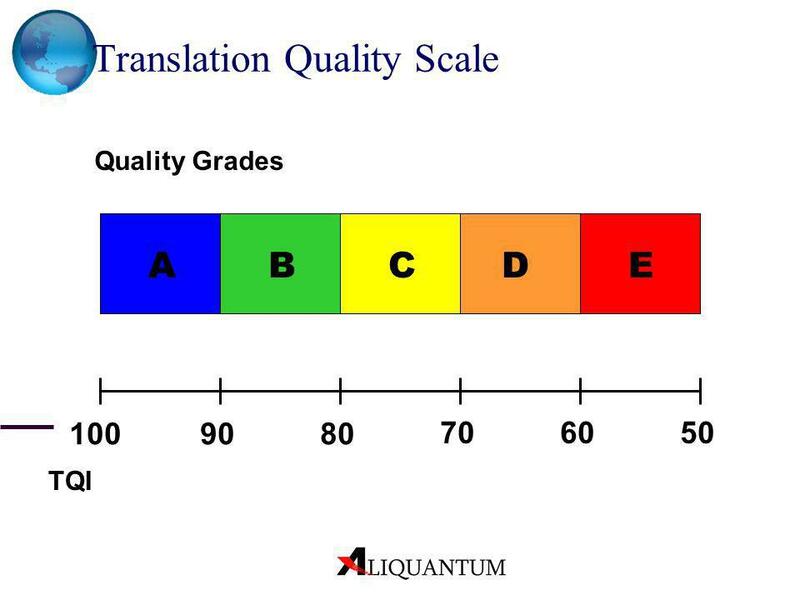 Probably the first reaction of a translator is that translation quality cannot be measured, but that he or she can tell good-quality translation from a middling or poor one. 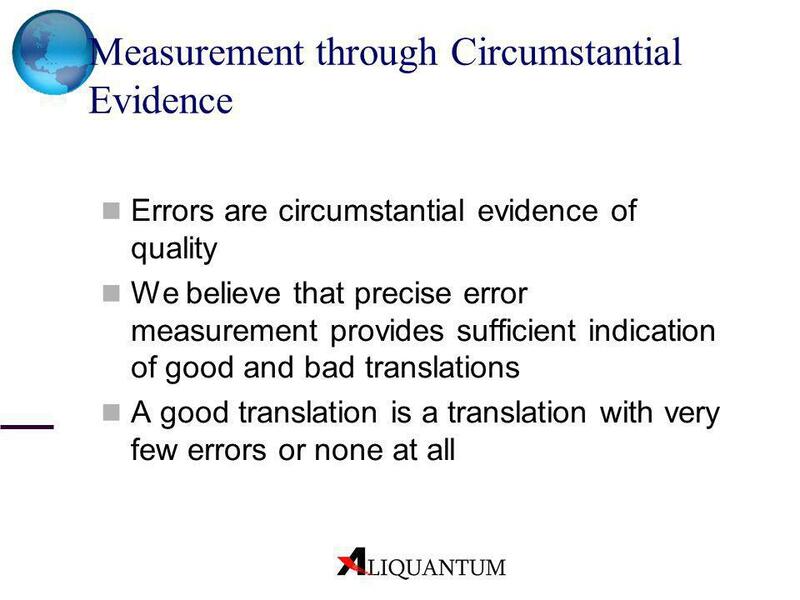 This is all for the good, but without quality measurement, your “good” translation could be my “poor” one, etc. 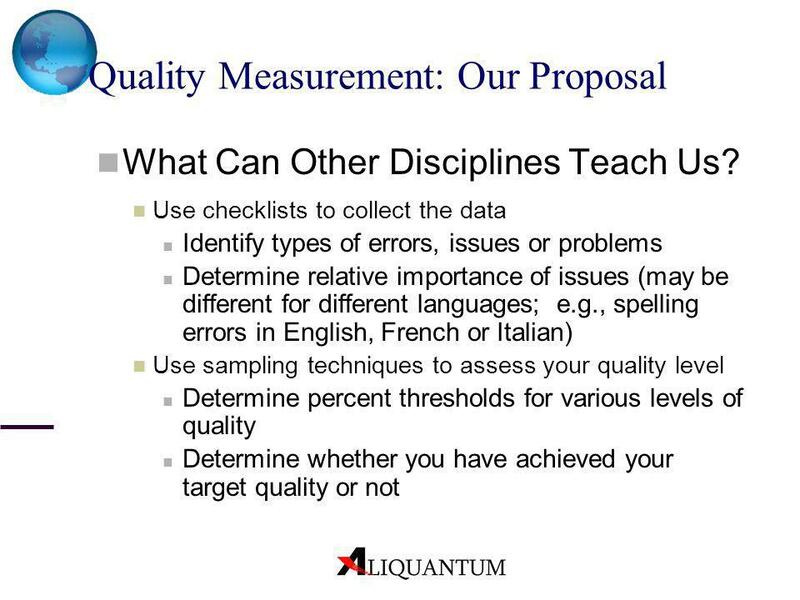 We should distance ourselves from subjective quality criteria and strive for objective ones. 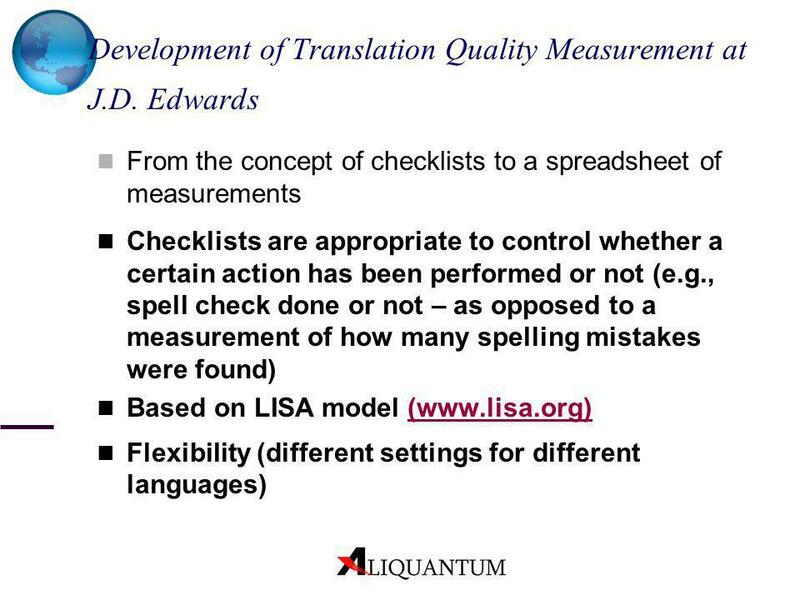 Of course, all of this only concerns technical or business translation... translation quality metrics for literary translation would be as inappropriate as indeed would any attempt to judge any artistic endeavor on quantitative criteria. 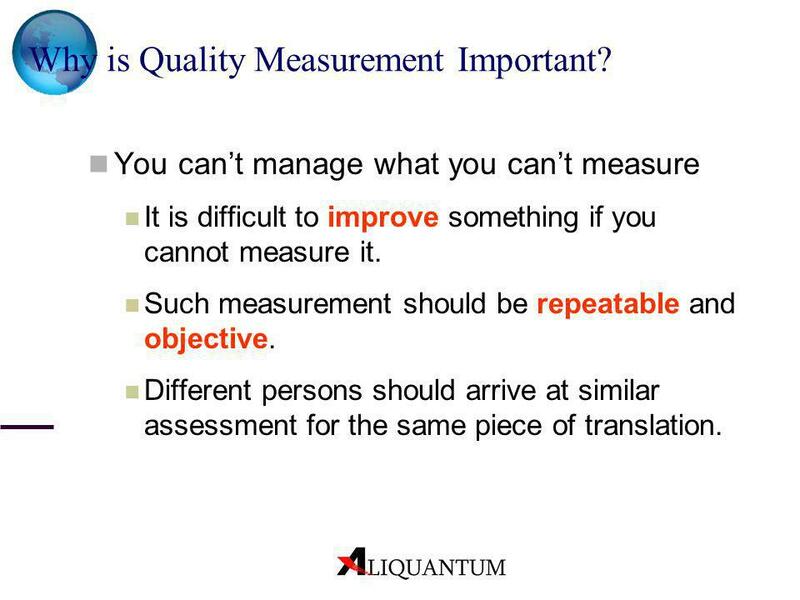 5 Overview Why Is Quality Measurement Important? 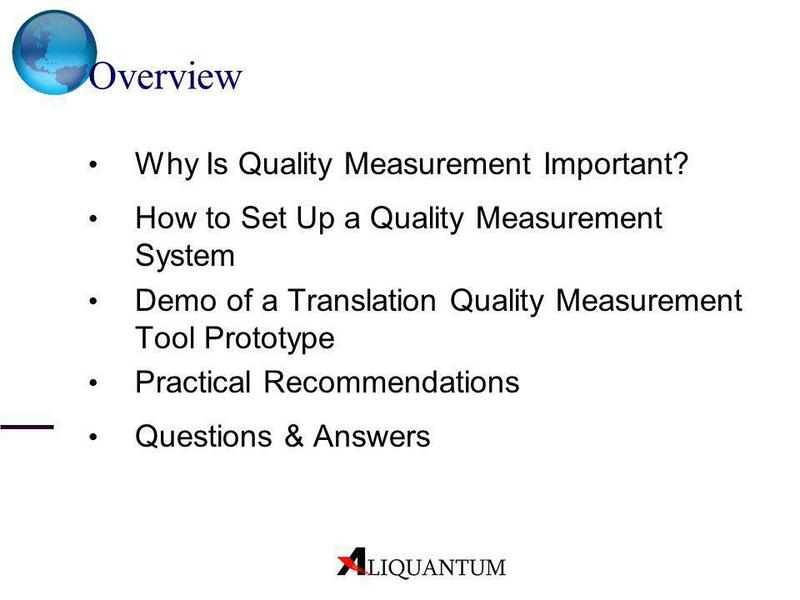 How to Set Up a Quality Measurement System Demo of a Translation Quality Measurement Tool Prototype Practical Recommendations Questions & Answers Last year, we introduced the concept of the Translation Quality Index (TQI), an innovative approach to the measurement of quality in translation. 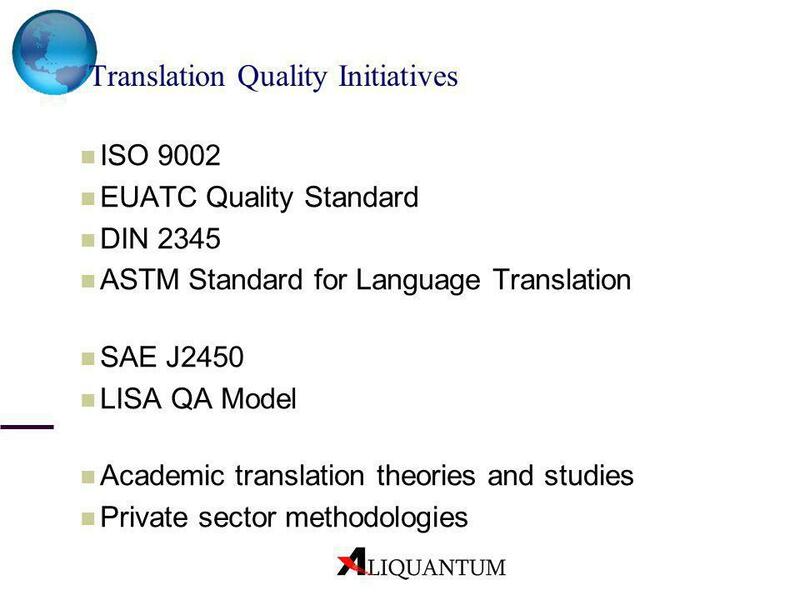 This year, we will expand on this topic and present additional research in the field of translation quality assurance. 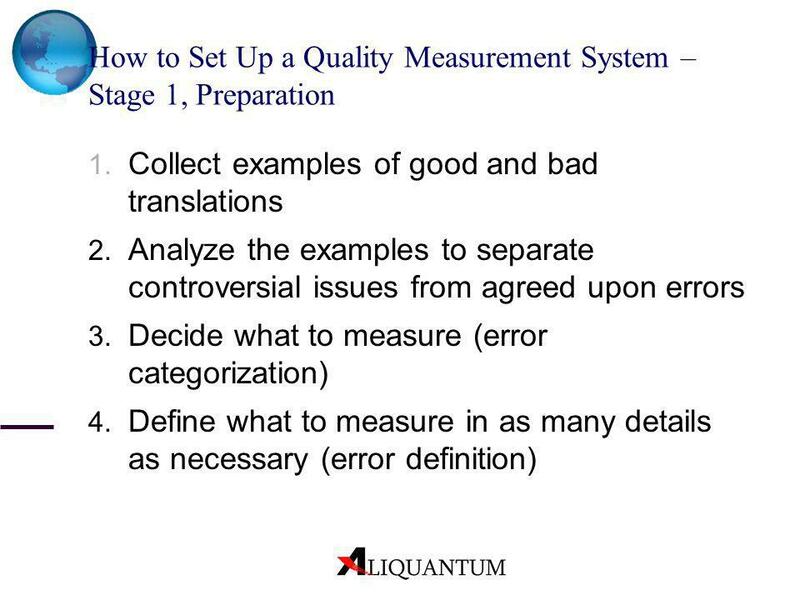 In particular, we will show how to set up a quality measurement process and present the prototype of a tool for measuring translation errors in a more consistent way. 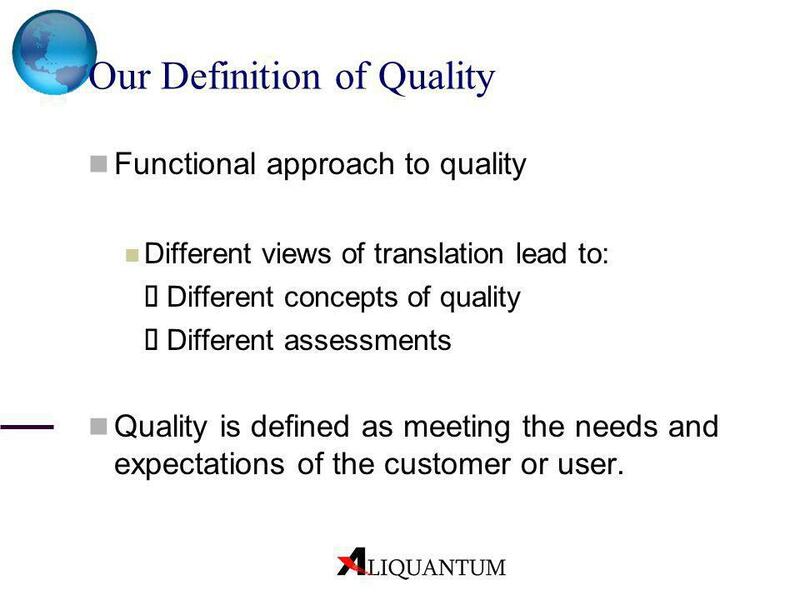 Functional approach to quality Different views of translation lead to: ð Different concepts of quality ð Different assessments Quality is defined as meeting the needs and expectations of the customer or user. Item 2: (House, 1997; as quoted in Schäffner, 1998). 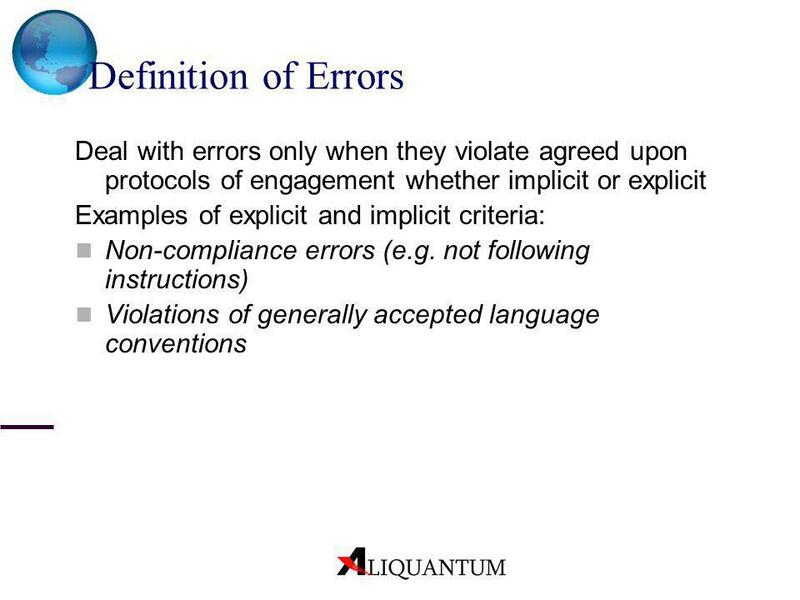 implicit or explicit (Newmark... I don’t have the exact quote). 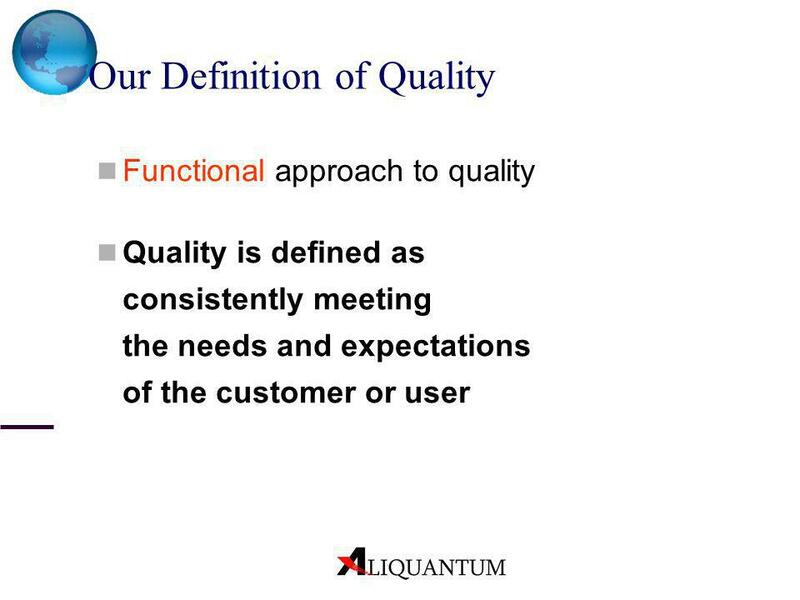 Functional approach to quality Quality is defined as consistently meeting the needs and expectations of the customer or user Different views of translation lead to: Different concepts of quality Different assessments Quality is defined as consistently meeting the needs and expectations of the customer or user. 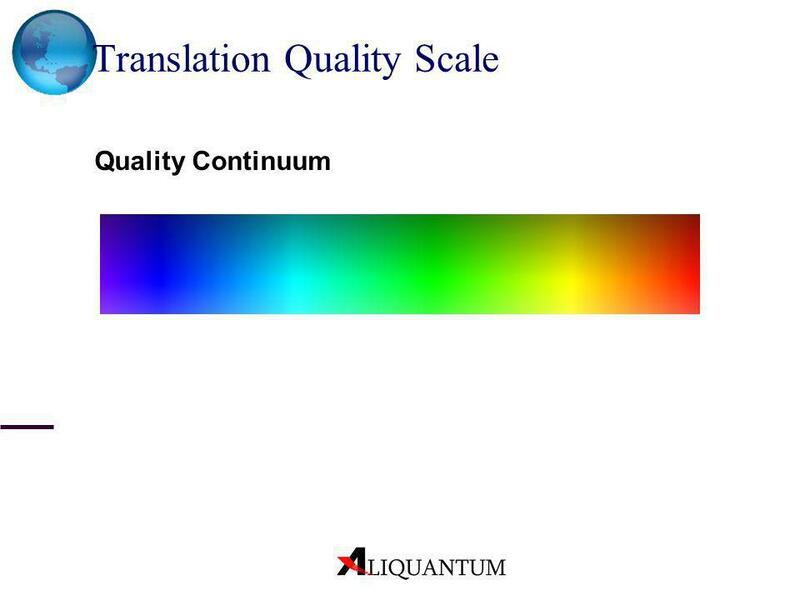 “A predictable degree of uniformity and dependability at low cost and suited to the market” – Deming “Evaluating the quality of a translation presupposes a theory of translation. 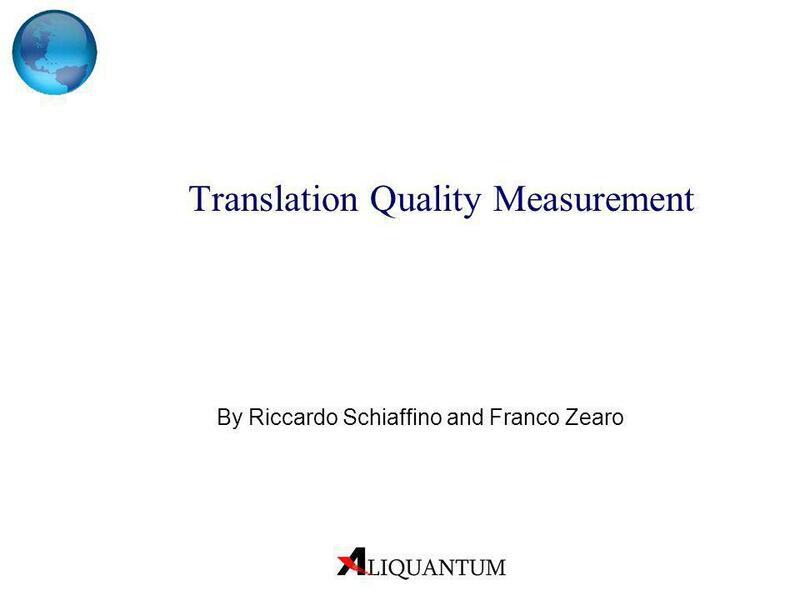 Thus different views of translation lead to different concepts of translation quality, and hence different ways of assessing it.” (House, 1997; as quoted in Schäffner, 1998). 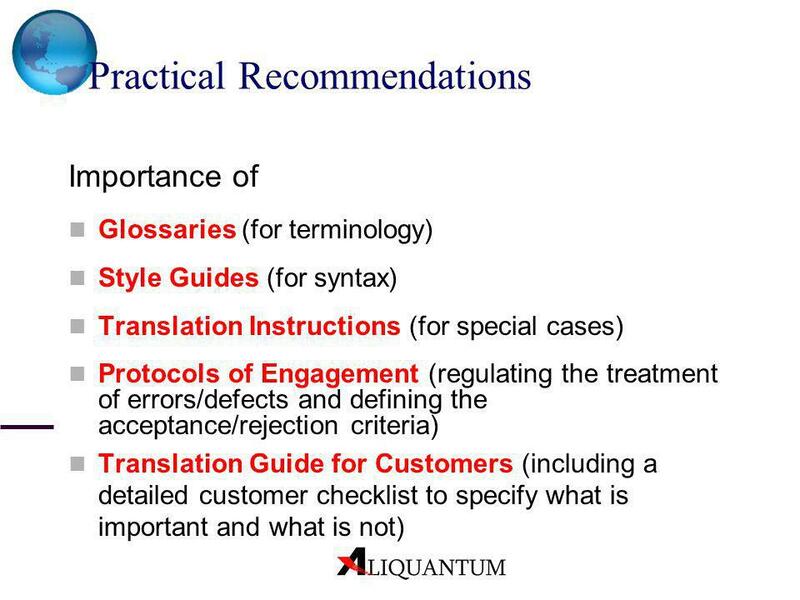 Any act of translation presupposes a theory of translation, implicit or explicit (Newmark... I don’t have the exact quote). 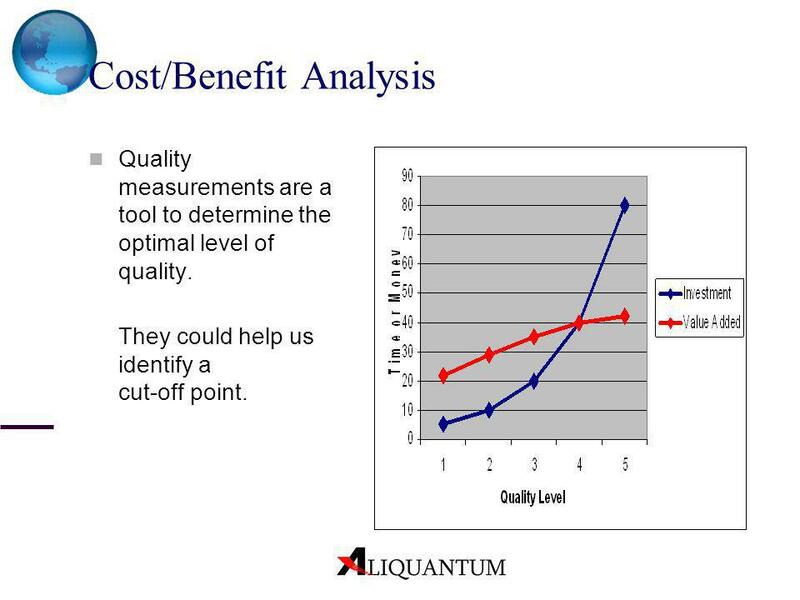 12 Why is Quality Measurement Important? You can’t manage what you can’t measure It is difficult to improve something if you cannot measure it. 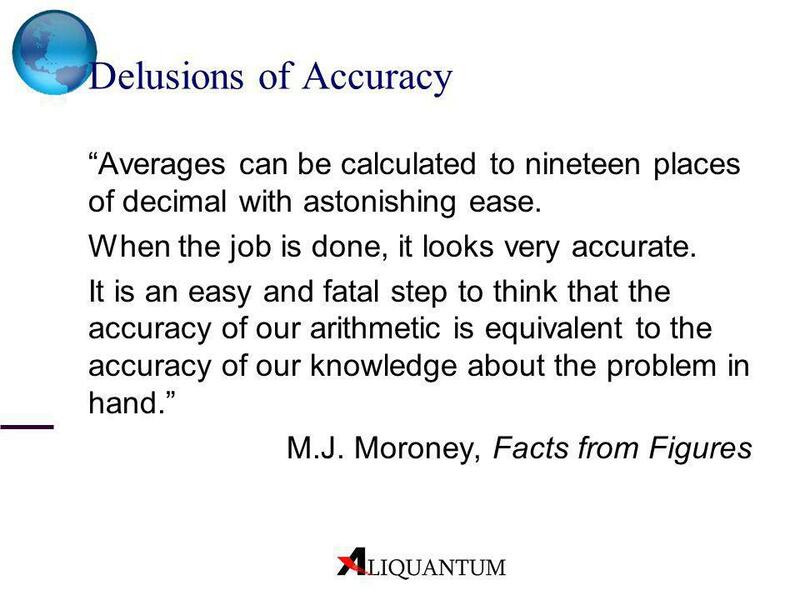 Such measurement should be repeatable and objective. 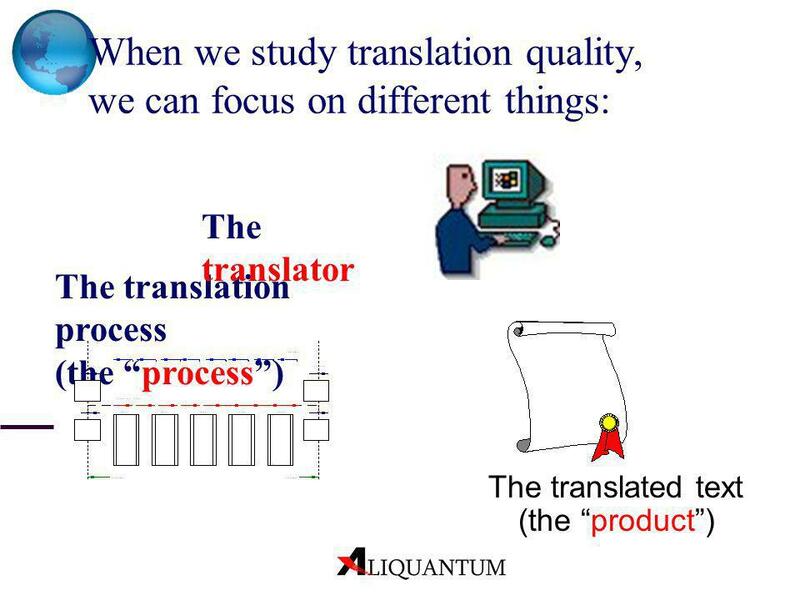 Different persons should arrive at similar assessment for the same piece of translation. 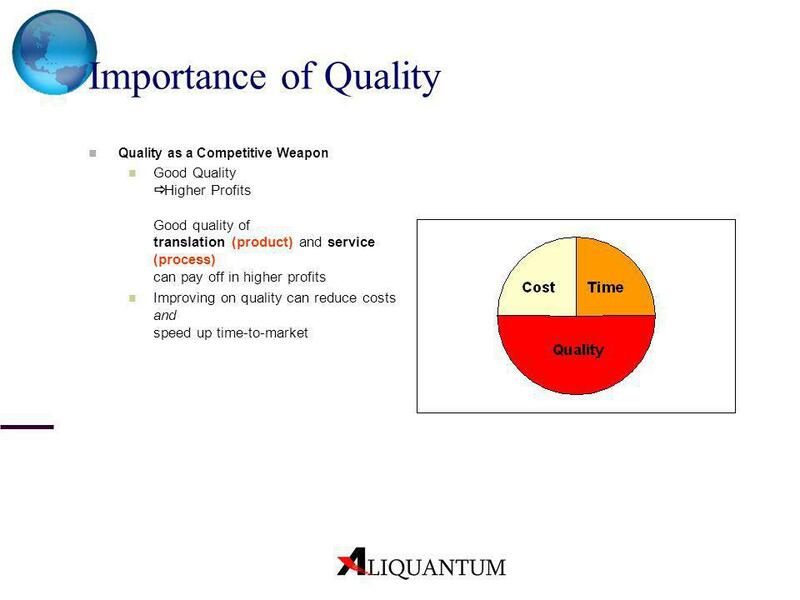 13 Why is Quality Measurement Important? 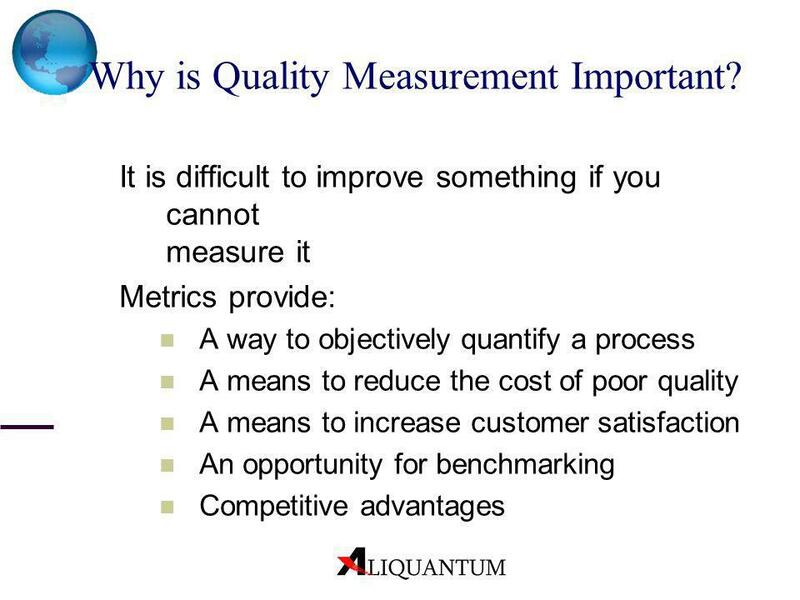 14 Why is Quality Measurement Important? 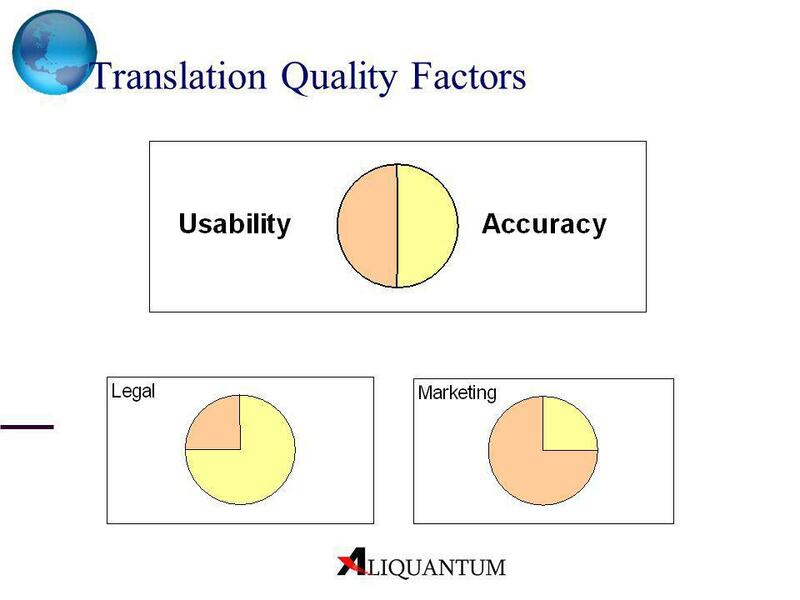 This is not true: There are certain components of translation quality that will always remain subjective. 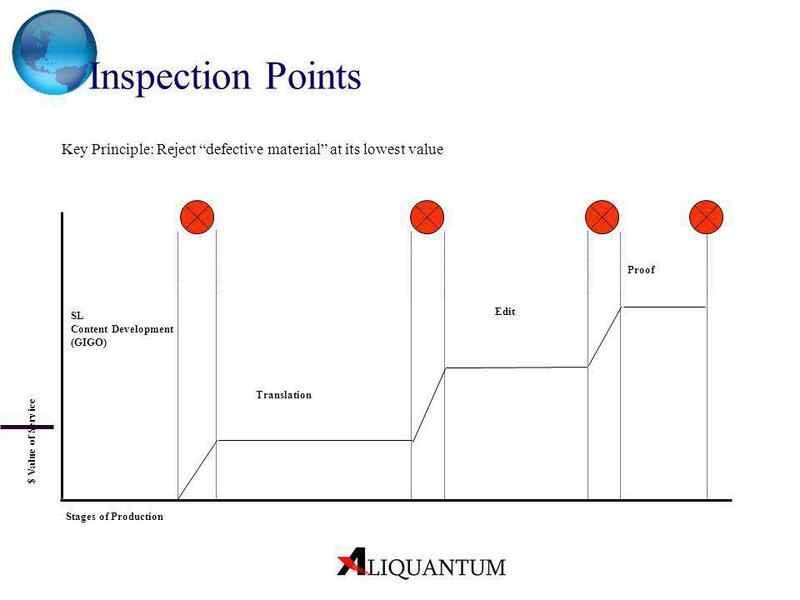 However, There are other elements that can be objectively measured. 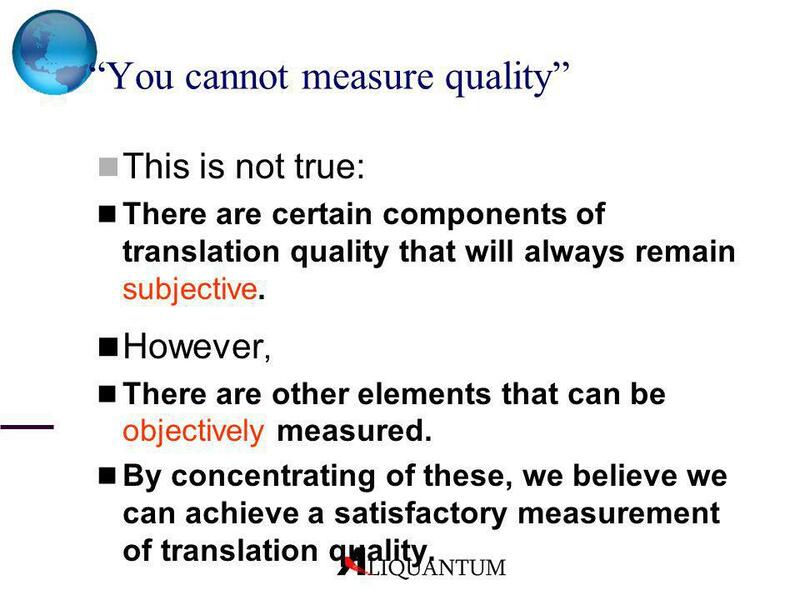 By concentrating of these, we believe we can achieve a satisfactory measurement of translation quality. 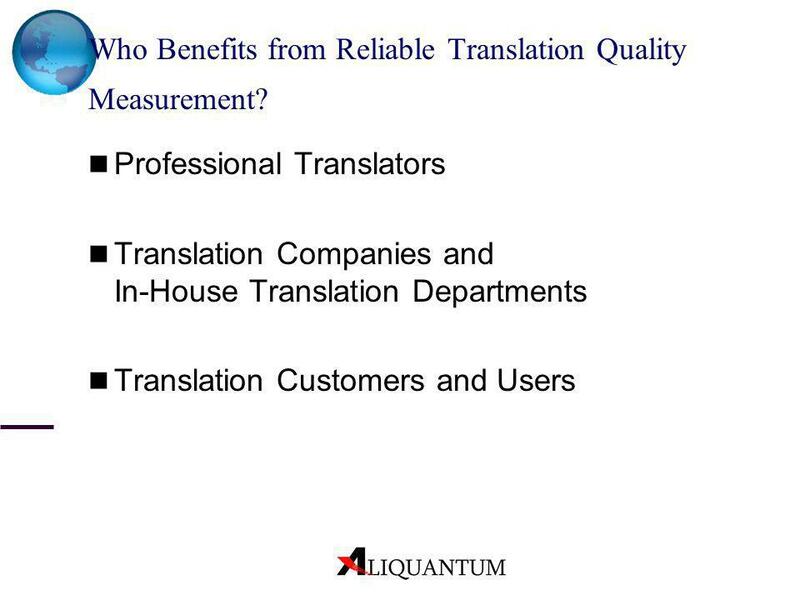 16 Who Benefits from Reliable Translation Quality Measurement? 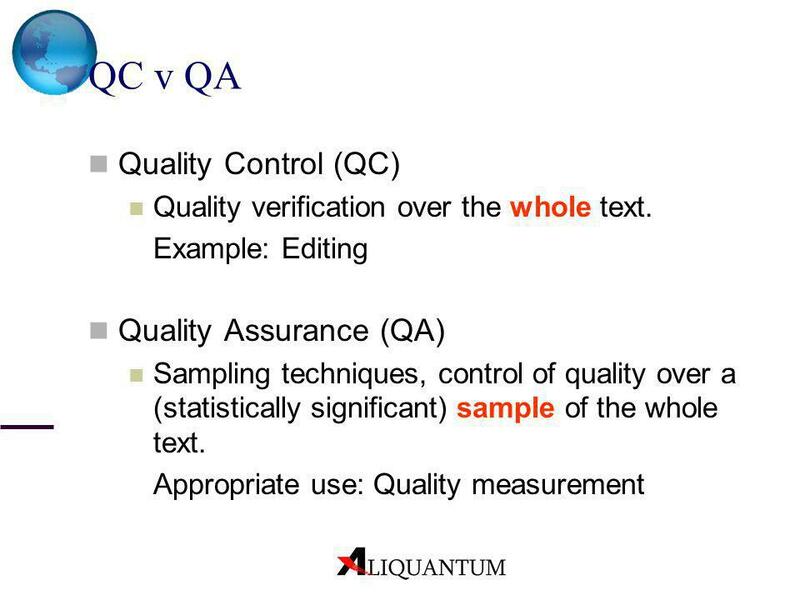 QC vs QA Quality Control (QC) Quality verification over the whole text. Example: editing. 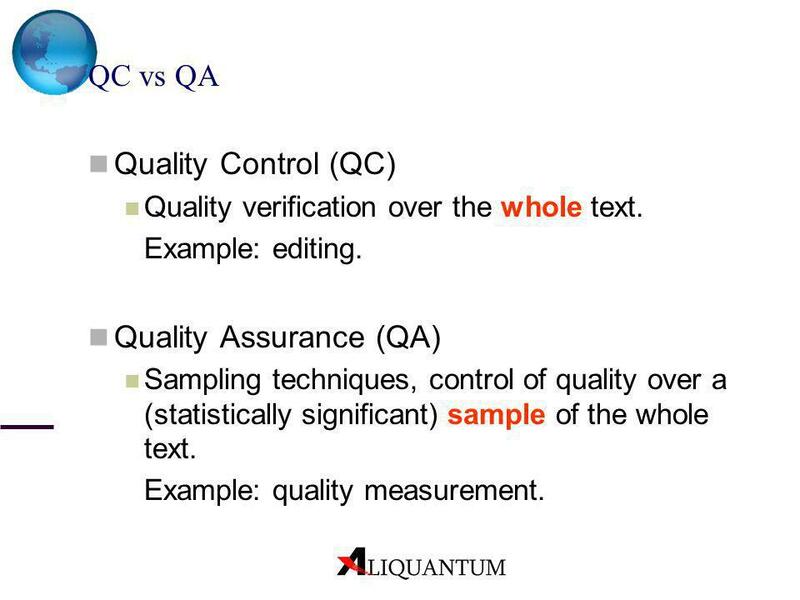 Quality Assurance (QA) Sampling techniques, control of quality over a (statistically significant) sample of the whole text. 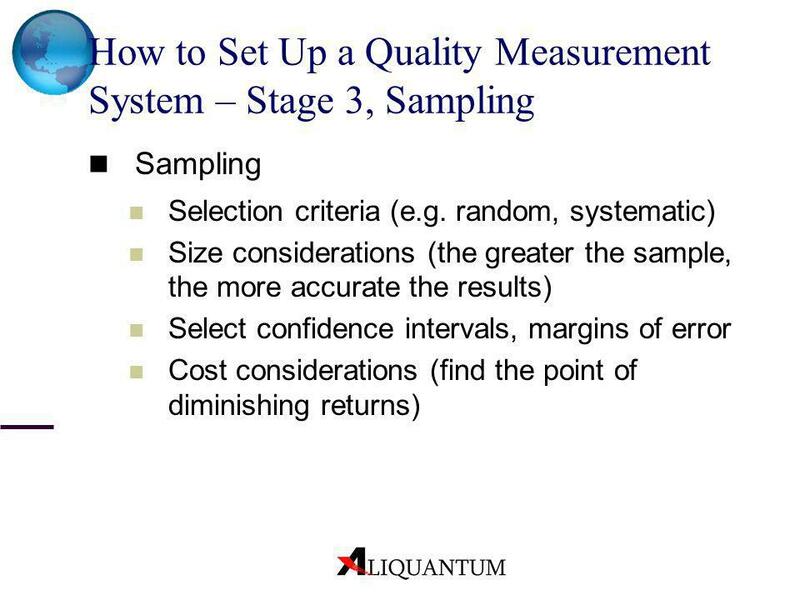 Example: quality measurement. 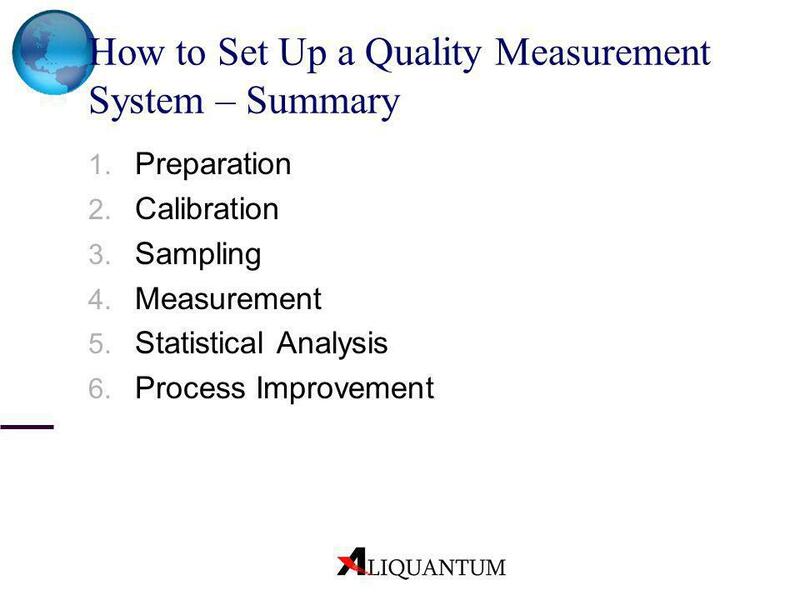 Quality measurements are a tool to determine the optimal level of quality. They could help us identify a cut-off point. The enemy of “good” is “better”. 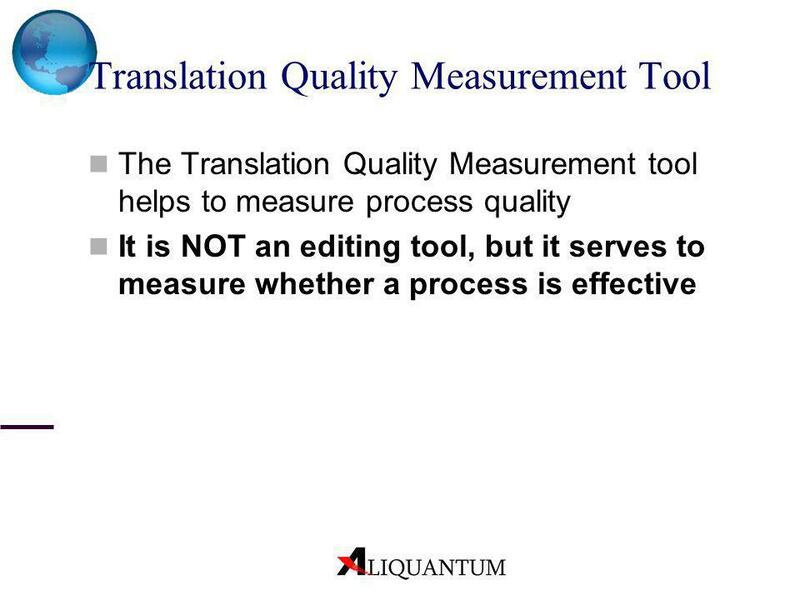 Quality measurements give us the tools to determine precisely which level of translation quality we should aim at. 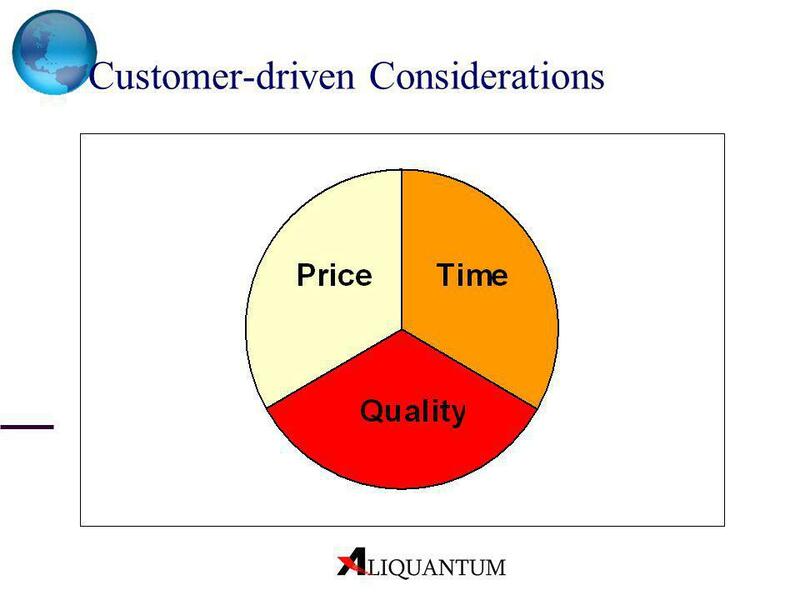 There is probably a point at which any additional dollar (or additional hour) spent in improving quality buys less and less improvement. 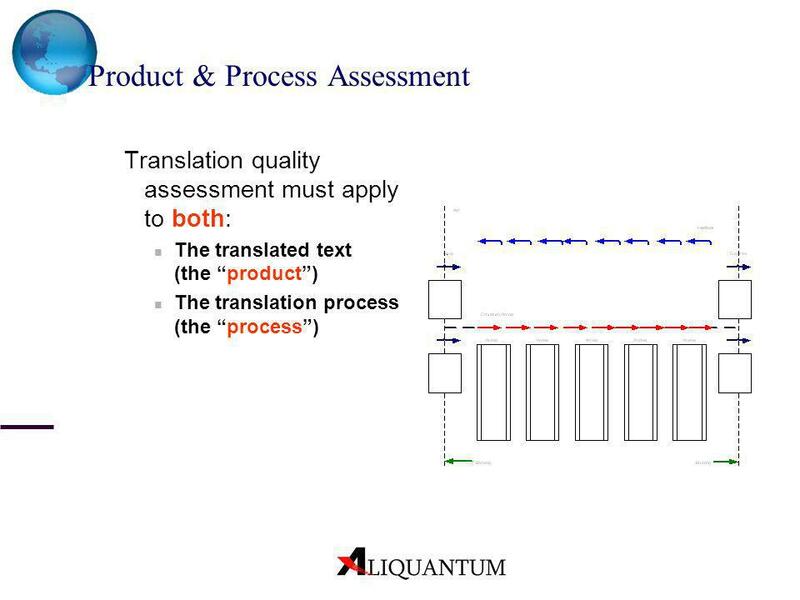 Translation quality assessment must apply to both: The translated text (the “product”) The translation process (the “process”) Does following to the letter a controlled process = quality, as the ISO 9000 certification seems to imply? (ISO 9000 example; example from “Dilbert” has been removed due to copyright concerns.) 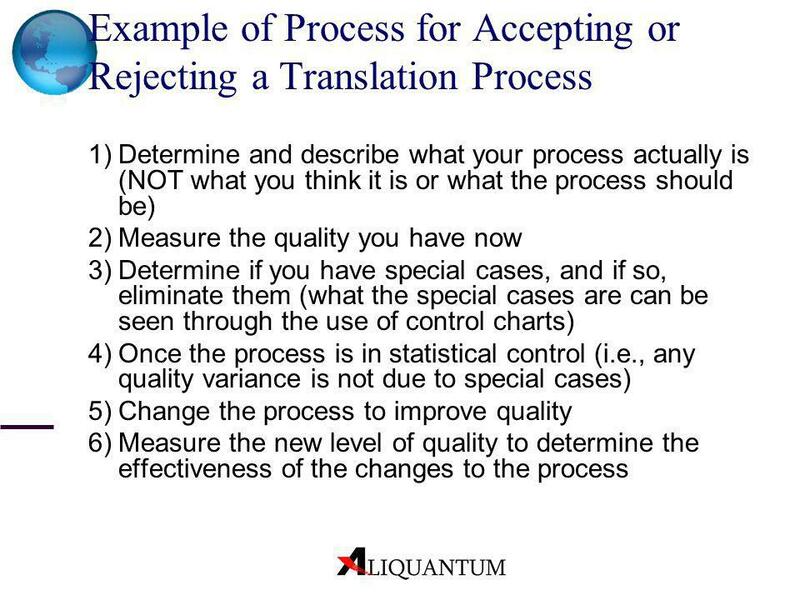 We do not think so: Not only must the process be accurately described and implemented, but it must be well thought out and appropriate. 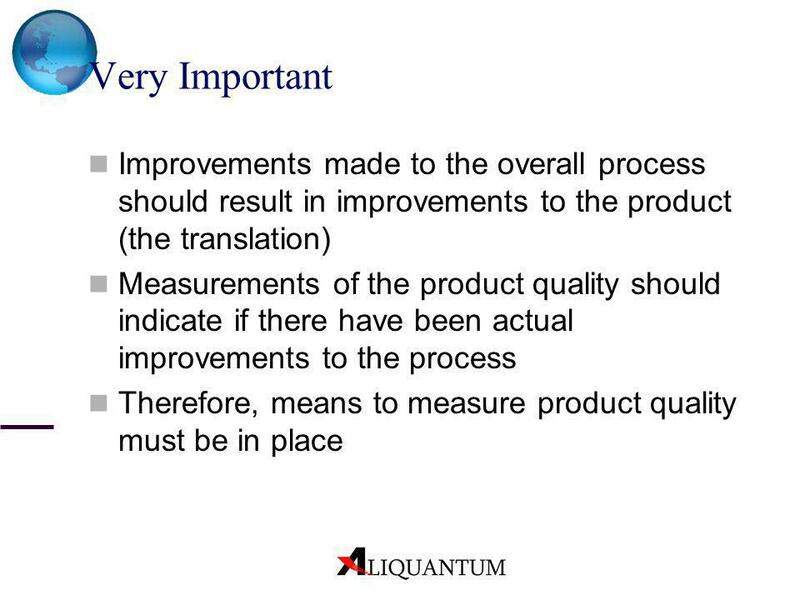 In this case, following the process may be an external indication that quality is being built in the process itself. What Can Other Disciplines Teach Us? 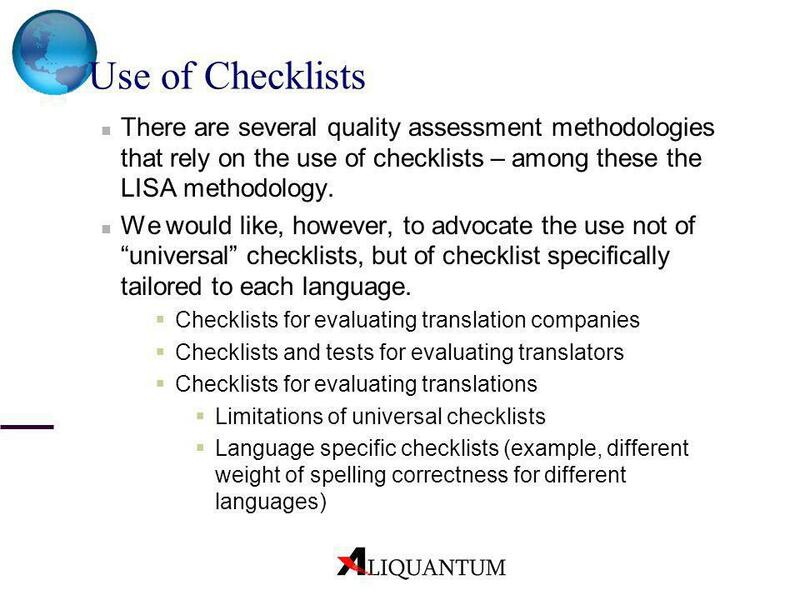 Use checklists to collect the data Identify types of errors, issues or problems Determine relative importance of issues (may be different for different languages; e.g., spelling errors in English, French or Italian) Use sampling techniques to assess your quality level Determine percent thresholds for various levels of quality Determine whether you have achieved your target quality or not Contribution of other disciplines to the measurement of quality in translation Ideas from software development project management techniques There are some statistical methods used in the management of software development projects that we think are suitable to be adapted to the management of translation projects, certainly as regards the translation of software products but also other technical translation projects as well. 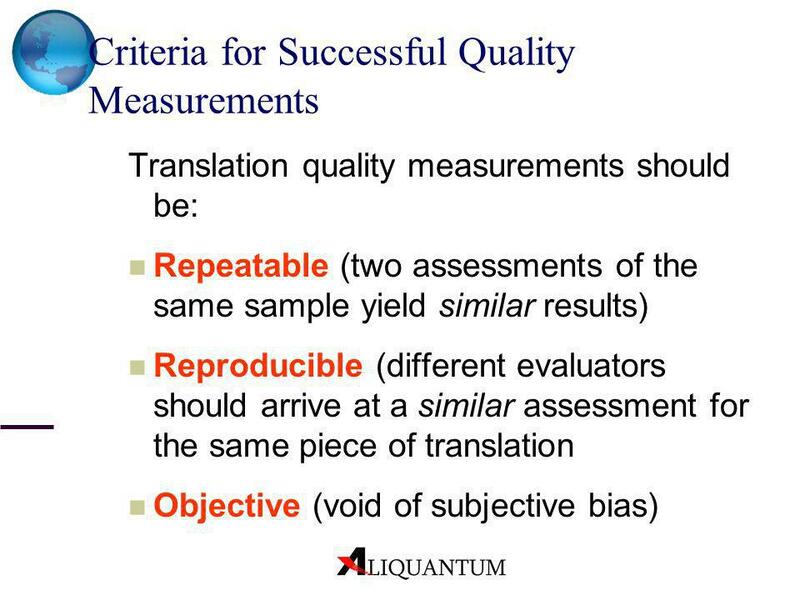 Translation quality measurements should be: Repeatable (two assessments of the same sample yield similar results) Reproducible (different evaluators should arrive at a similar assessment for the same piece of translation Objective (void of subjective bias) Such measurement should be repeatable (i.e., consistent), objective (i.e., different persons should arrive at similar assessment for the same piece of translation). This means that it has to be, void—as much as possible—of subjective bias. Note the emphasis on “similar”: Ideally, it should be “same”. 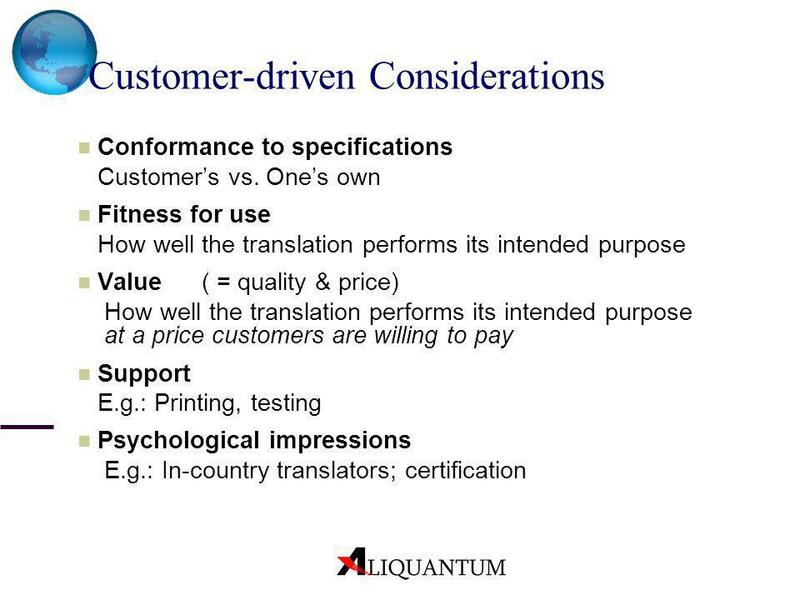 But, alas, translation evaluation is still a very subjective undertaking. 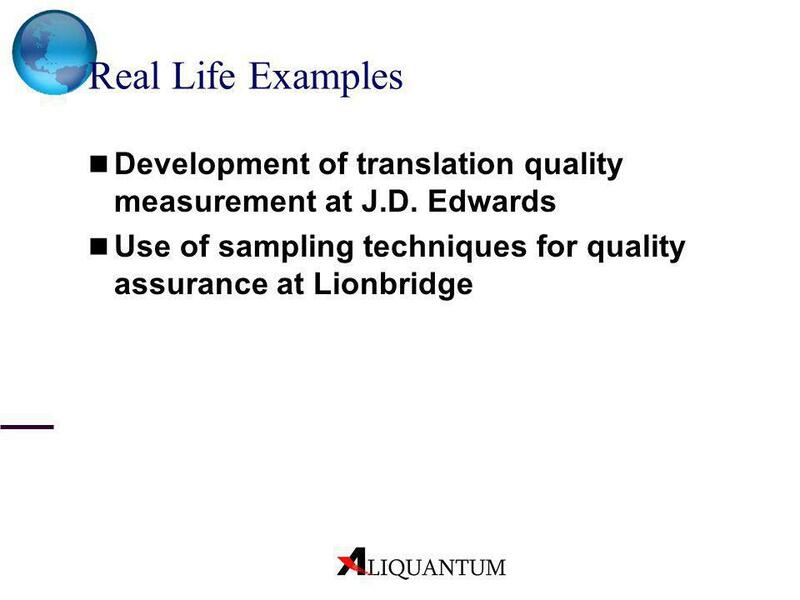 38 Real Life Examples Development of translation quality measurement at J.D. 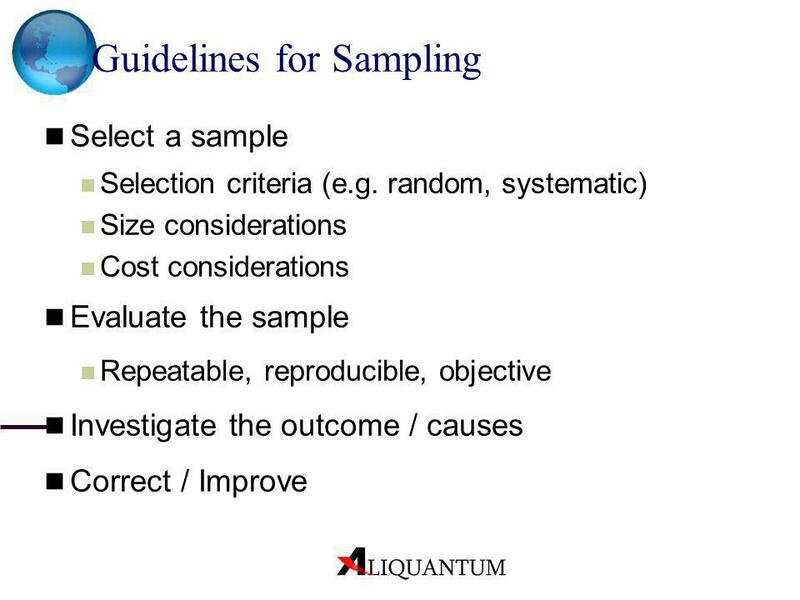 Edwards Use of sampling techniques for quality assurance at Lionbridge (Riccardo) Use Quality Assurance forms to collect the data Identify types of errors, issues or problems Determine relative importance of issues (may be different for different languages; e.g., spelling errors in English, French or Italian) Use sampling techniques to assess your quality level Determine percent thresholds for various levels of quality Determine whether you have achieved your target quality or not (continuation of note from previous page) Suppose now that the additional material translated for release 1.5 had a defect density of 7 error per 1000 words. 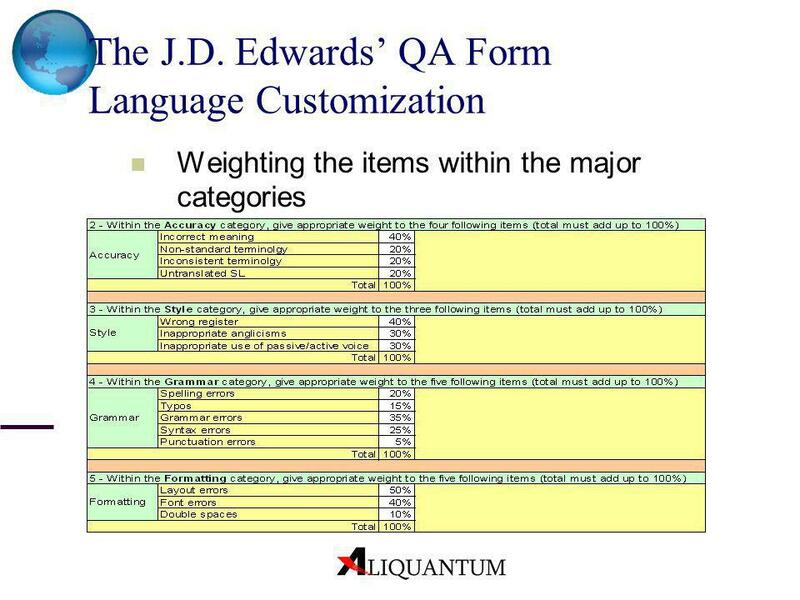 You now translate version 2.0, and are finding a defect density of 2 error per 1000 words. 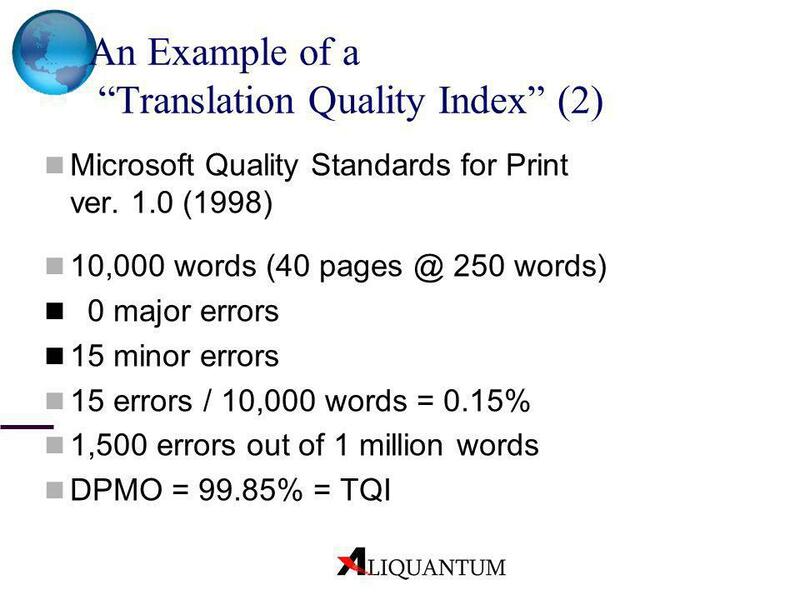 Unless you have good reason to think that your translation process was dramatically improved, you would expect to find normally between 5 and 7 errors per 1,000, and finding only 2 per 1,000 words may suggest that there is still quite a bit editing and QC work to do. 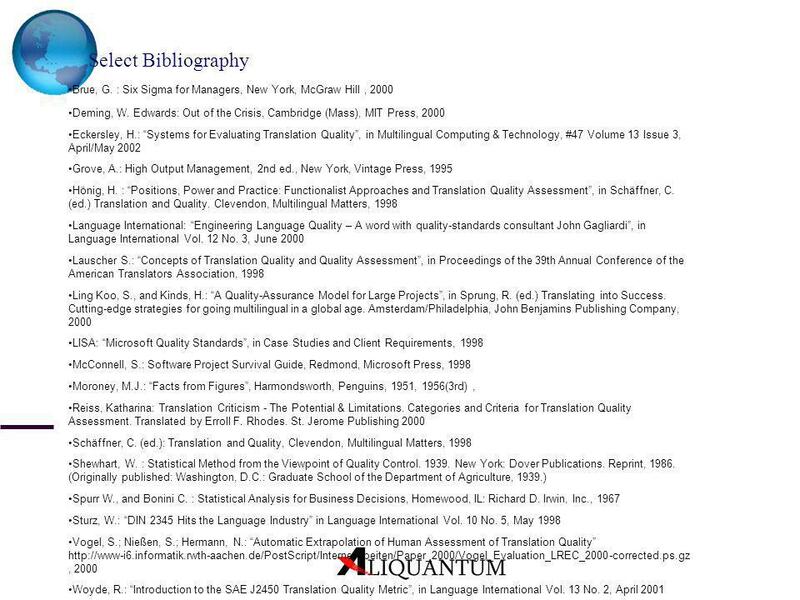 The more good historical data you have, the better your forecasts will be about the amount of work necessary to identify and correct errors before the actual release of the translation project. 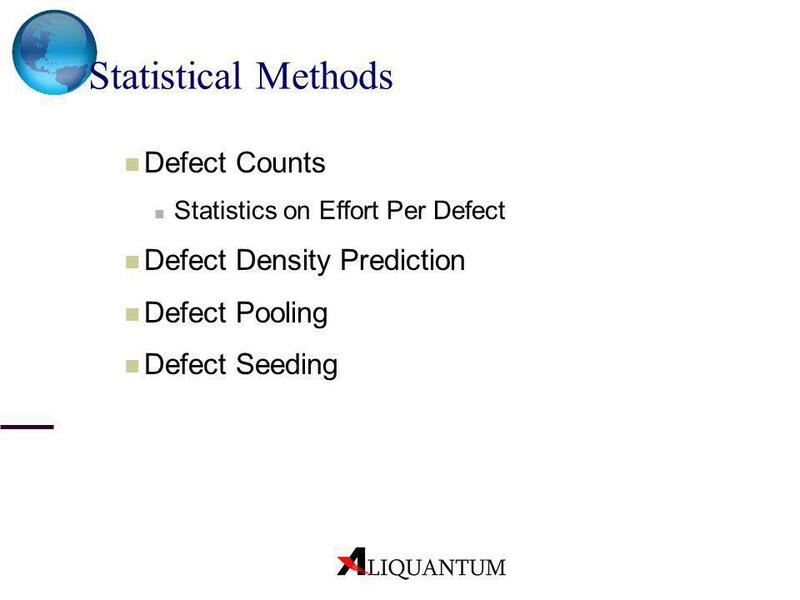 Defect pooling A simple defect prediction technique is to separate defects into two pools Defect seeding Technique by which a known number of defects is deliberately seeded in a work as a means of estimating how many (unseeded) defects are left to find: by seeing how many of the known defects are found during a QC operation and how many ‘unseeded’ ones are found, it is possible to estimate how many unseeded defects are left to find. 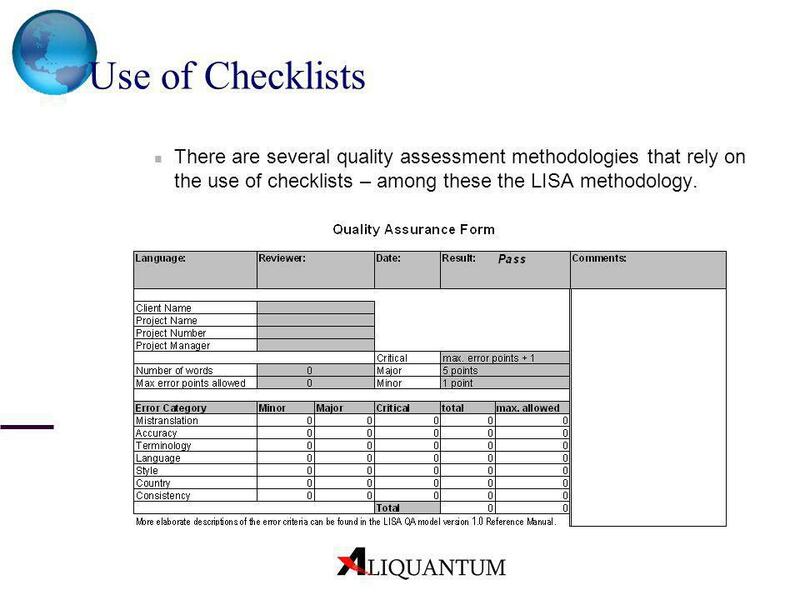 51 Use of Checklists There are several quality assessment methodologies that rely on the use of checklists – among these the LISA methodology. 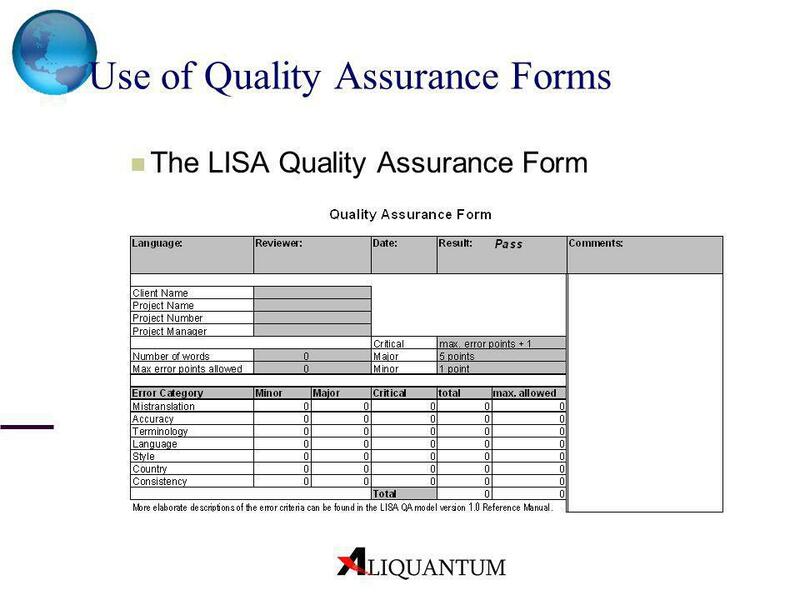 The LISA Quality Assurance Form J.D. 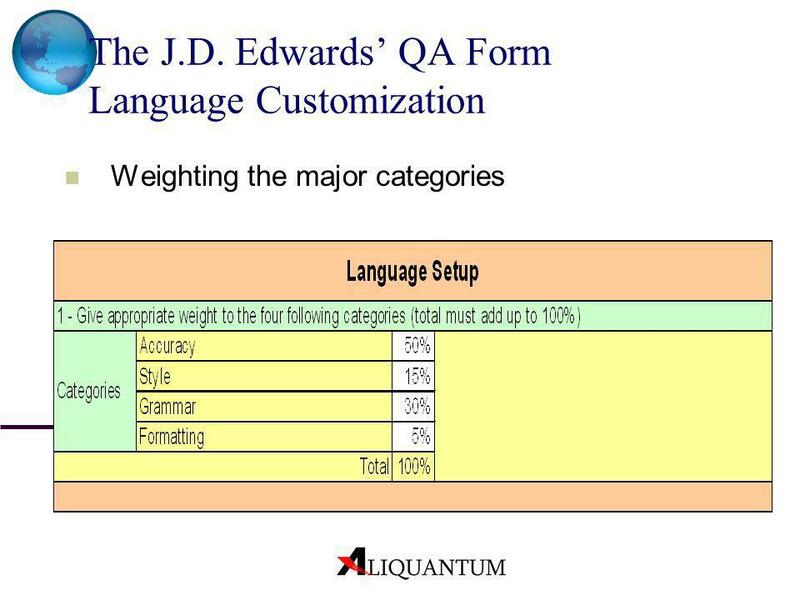 Edwards loosely based its Quality Assurance Form on the LISA Quality Assurance Form Lionbridge developed its own Language Compliance Form It is important to remember that these tools are for assessing the performance achieved: They are not quality control instruments (as described earlier: QC = editing, proofreading, etc. 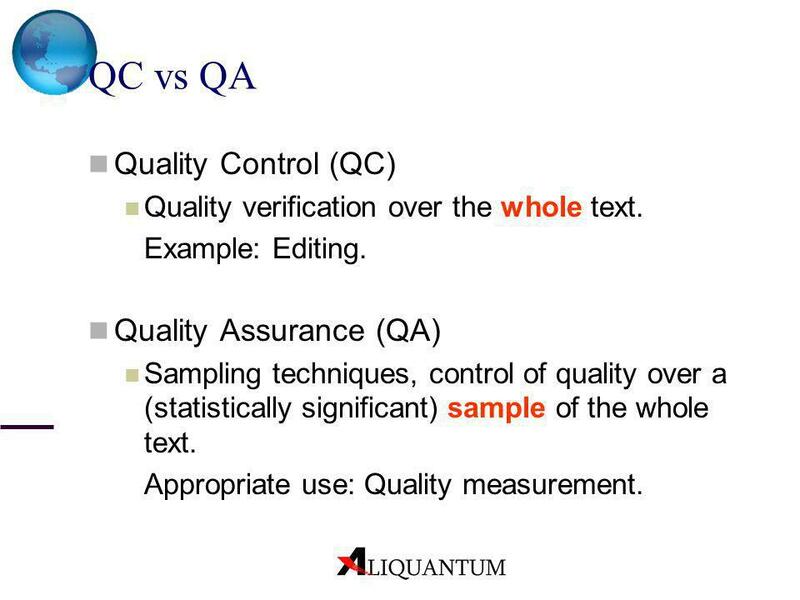 on the whole text, as against QA work on a sample of the text). 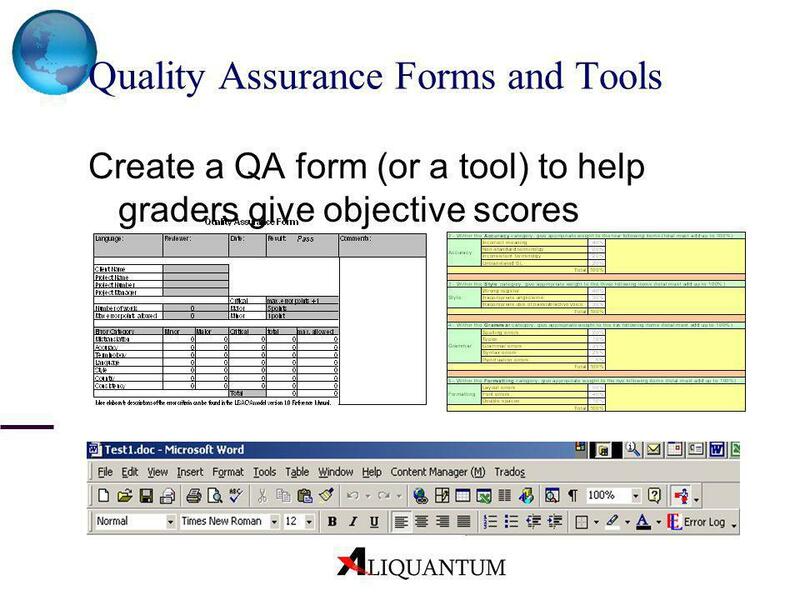 They may be used, instead, to verify how effective our quality control efforts are. 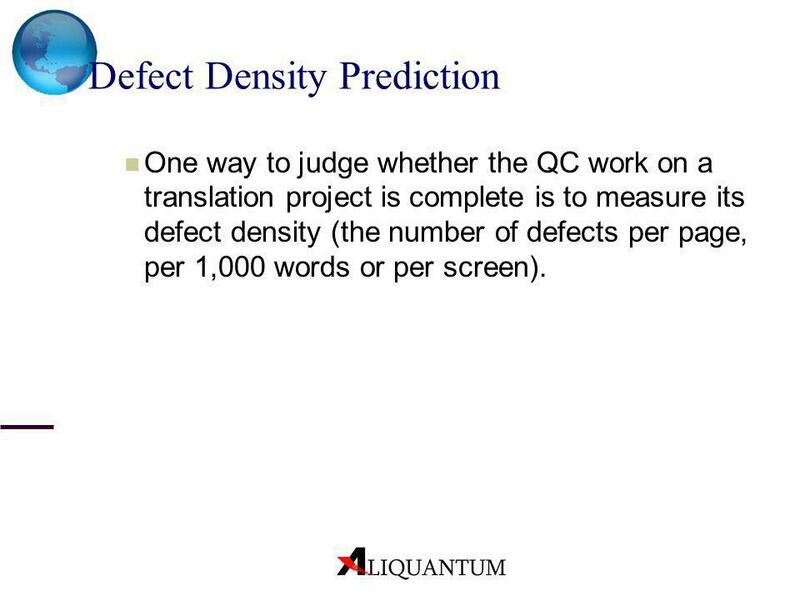 One way to judge whether the QC work on a translation project is complete is to measure its defect density (the number of defects per page, per 1,000 words or per screen). 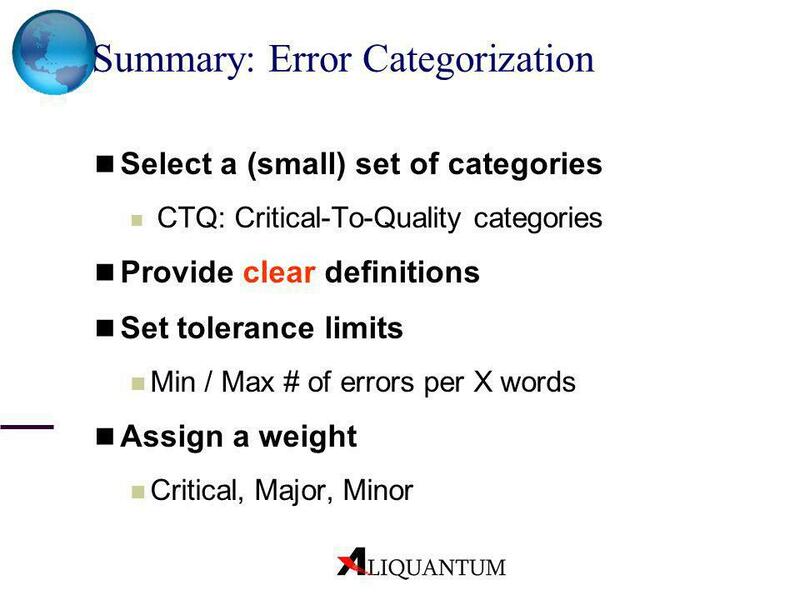 Suppose that release 1.0 of our documentation consist of 2,000,000 words, that the editing process detected and corrected 9,000 errors, and that a further 1,000 errors were discovered after the documentation was released: The overall defect count for this documentation release would be 10,000, with a density of 5 errors per 1000 words (about one error per page). 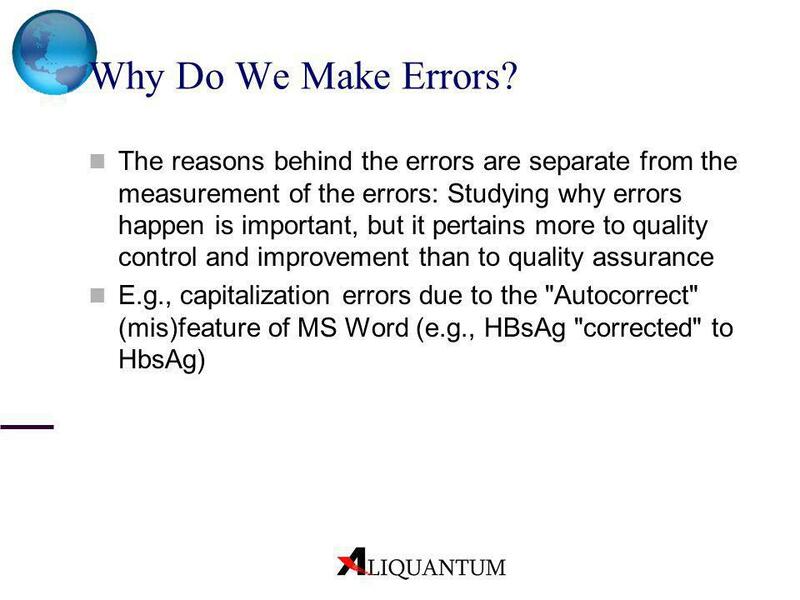 Suppose now that the additional material translated for release 1.5 had a defect density of 7 error per 1000 words. 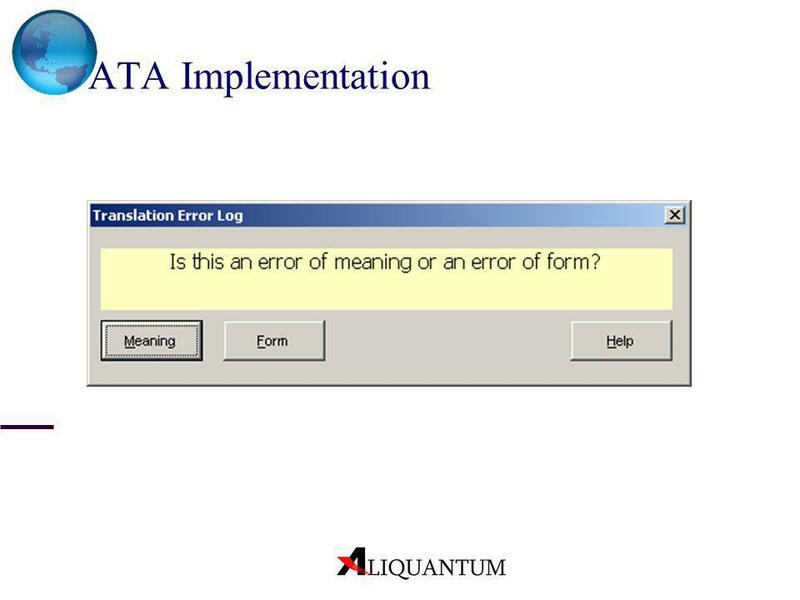 You now translate version 2.0, and are finding a defect density of 2 error per 1000 words. 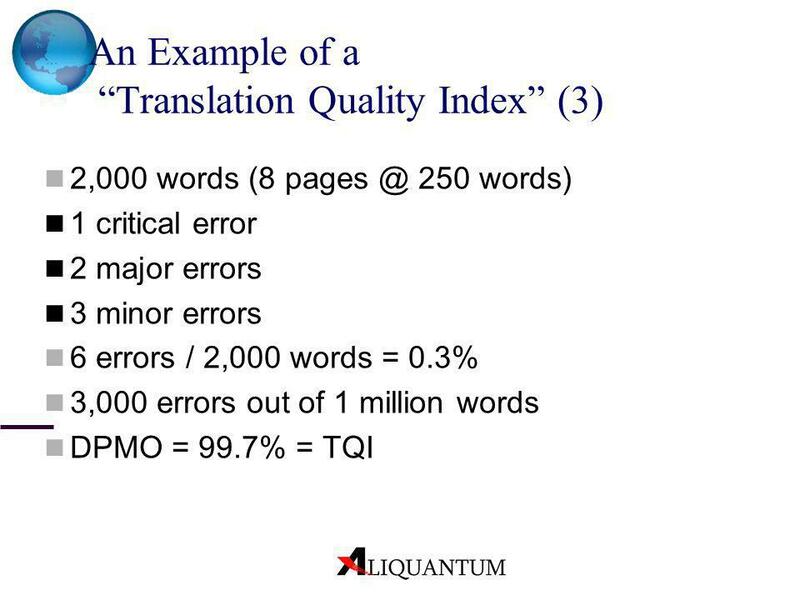 Unless you have good reason to think that your translation process was dramatically improved, you would expect to find normally between 5 and 7 errors per 1,000, and finding only 2 per 1,000 words may suggest that there is still quite a bit editing and QC work to do. 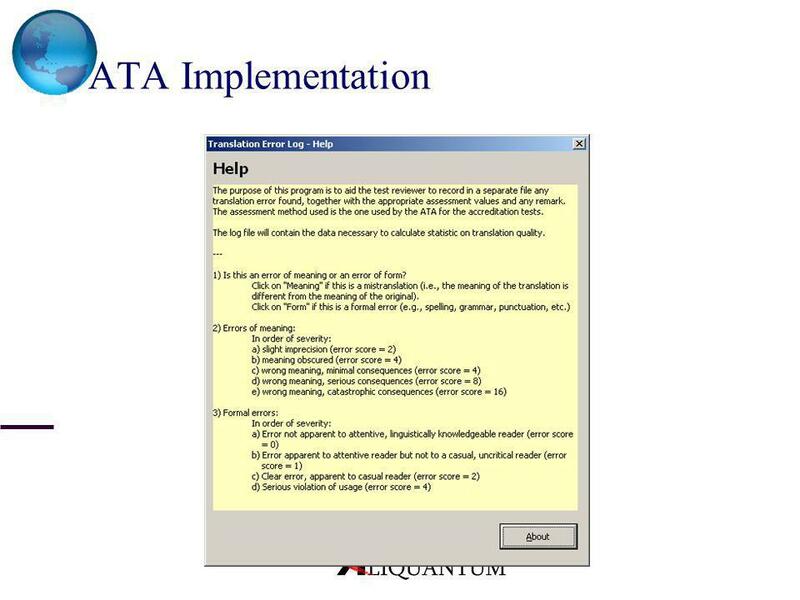 The better historical data you have, the better your forecasts will be about the amount of work necessary to identify and correct errors before the actual release of the translation project. 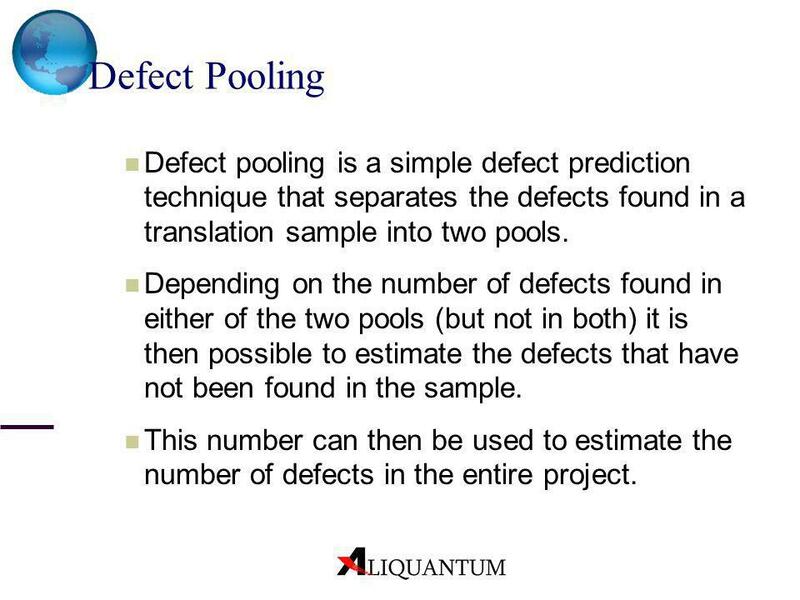 60 Defect Pooling Defect pooling is a simple defect prediction technique that separates the defects found in a translation sample into two pools. 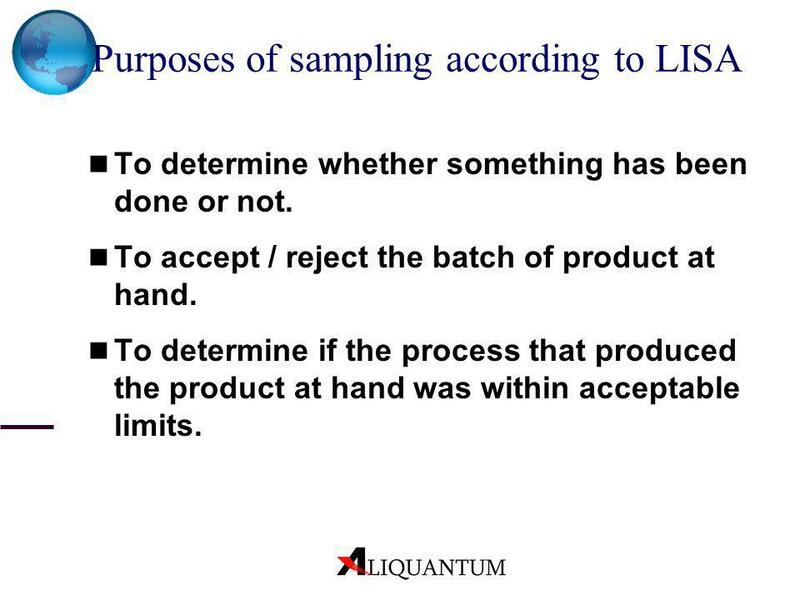 Depending on the number of defects found in either of the two pools (but not in both) it is then possible to estimate the defects that have not been found in the sample. 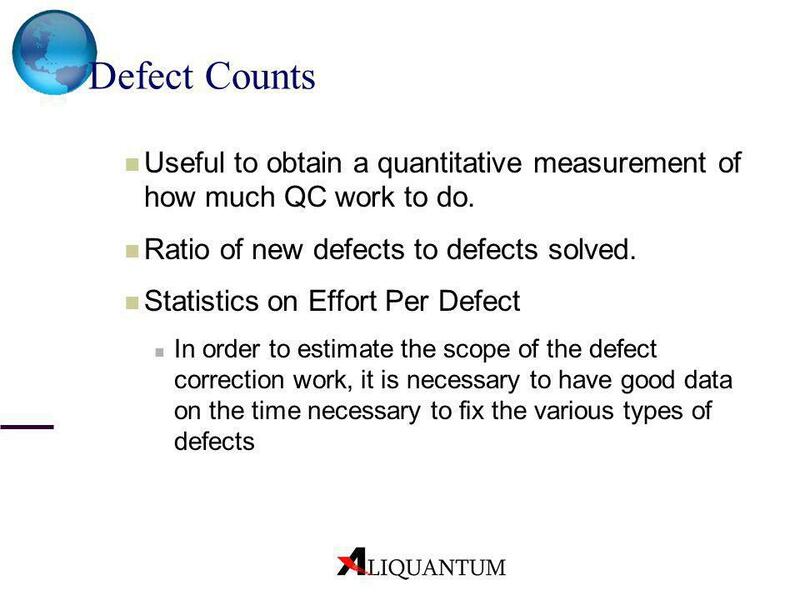 This number can then be used to estimate the number of defects in the entire project. 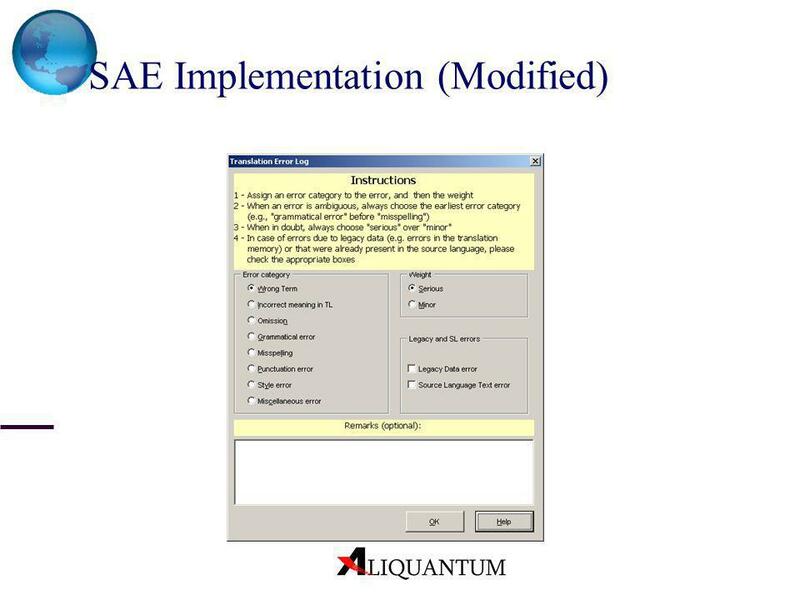 Assign same sample of translated material to two QA persons. Each QA person to work independently on whole sample. 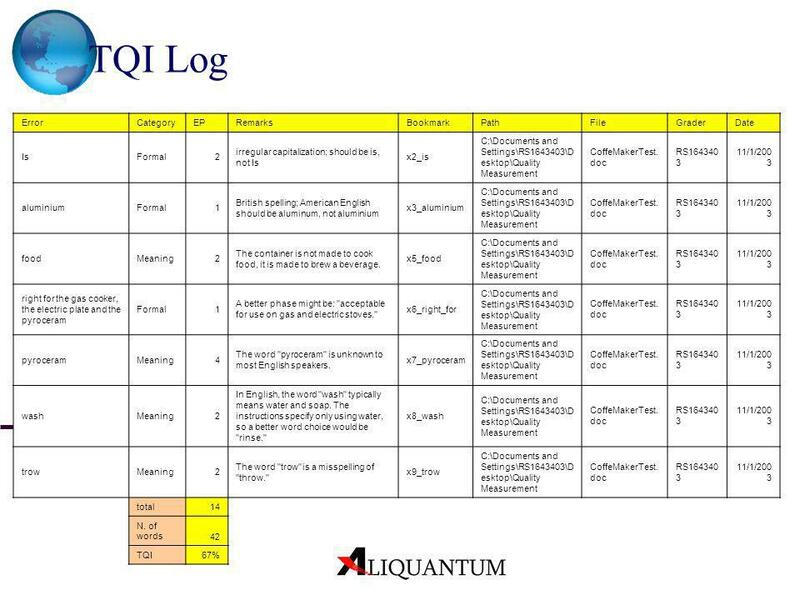 Track which defects have been reported by QA person A, by QA person B, and by both A and B. 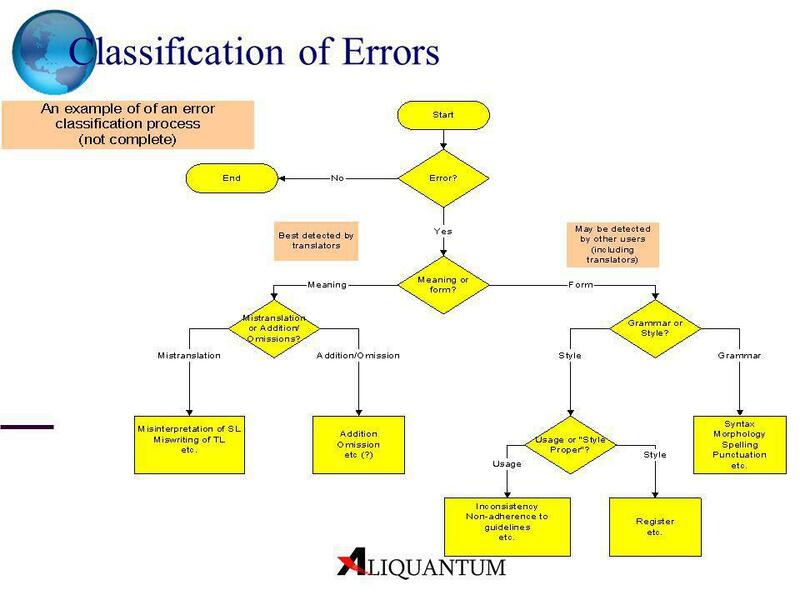 The number of unique defects in the sample will be given by the following formula: DefUnique=DefA+DefB-DefAB If the translation sample has 40 defects in pool A, 35 defects in pool B and 15 defects in both A and B, the number of unique defects would be =60 The number of total defects for the sample in question can be estimated using the following formula: DefTot=(DefA*DerfB)/DefAB The approximate number of total defects for teh sample would therefore be (40*35)/15=93 This number could then be used to extrapolate the total number of defects in the complete project, and could therefore be used as a yardstick to measure the QC effort against. 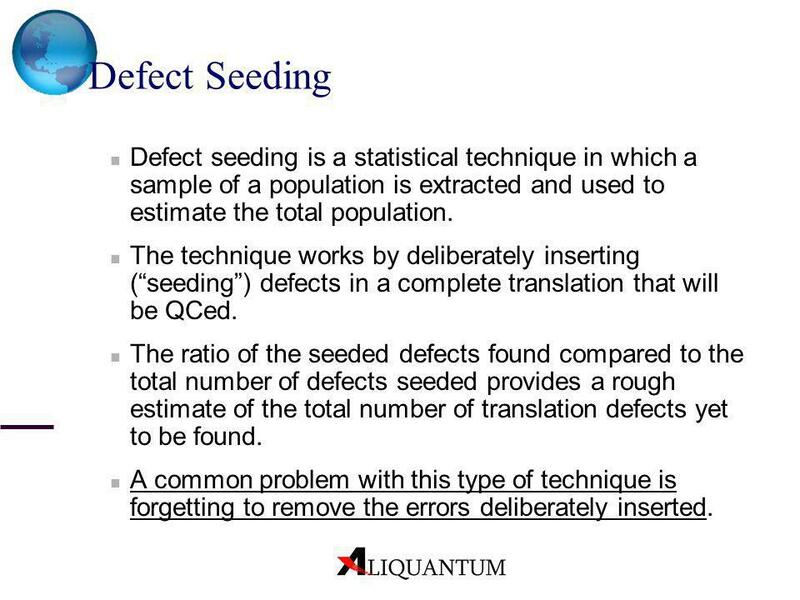 61 Defect Seeding Defect seeding is a statistical technique in which a sample of a population is extracted and used to estimate the total population. 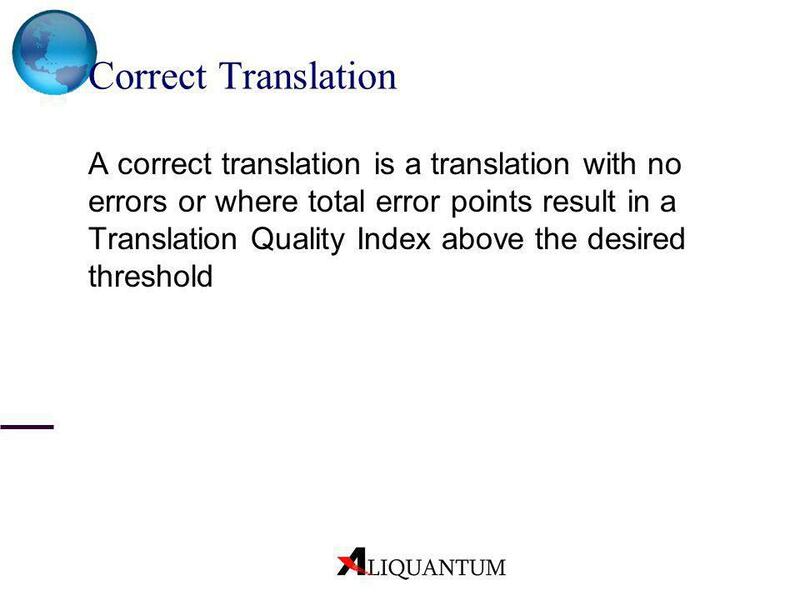 The technique works by deliberately inserting (“seeding”) defects in a complete translation that will be QCed. 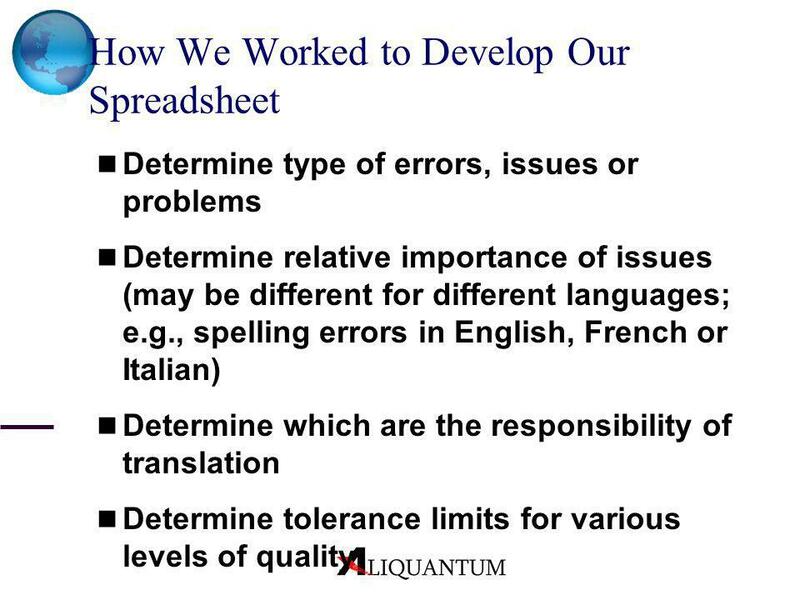 The ratio of the seeded defects found compared to the total number of defects seeded provides a rough estimate of the total number of translation defects yet to be found. A common problem with this type of technique is forgetting to remove the errors deliberately inserted. Say for example that you want to estimate the number of fish in a lake. You free in the lake a number (e.g., 100) of fish that had previously been tagged. You then catch fish from the lake. Depending on the ratio between tagged and untagged fish that you catch, you can then reliably estimate the total number of fish in the lake. So, if you catch 50 fish, and 5 of them are tagged, you can estimate that the total fish population in the lake is 1000. 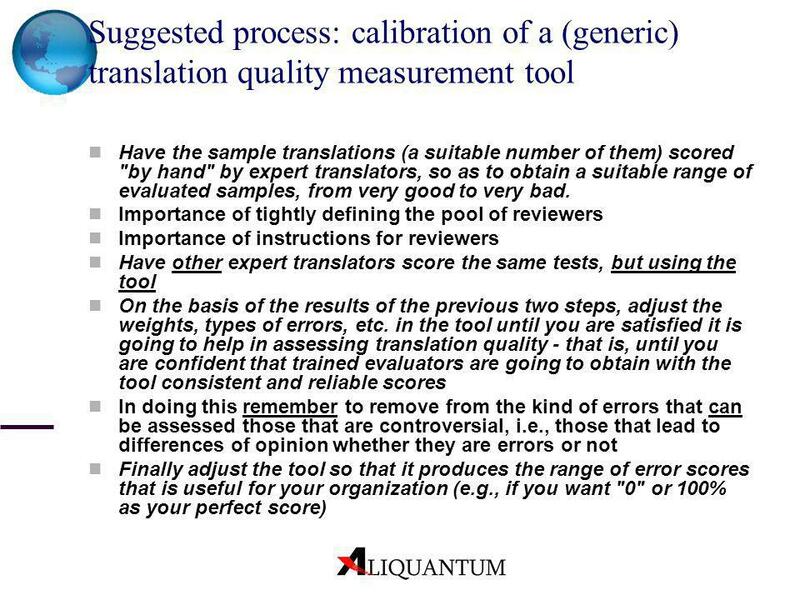 One of the things one can do to calibrate a translation quality measurement tool (or process) is to use error seeding: Not only to be able to estimate what percentage of errors is not discovered, but also in order to estimate how much variance there is in assessing the errors that do get discovered. 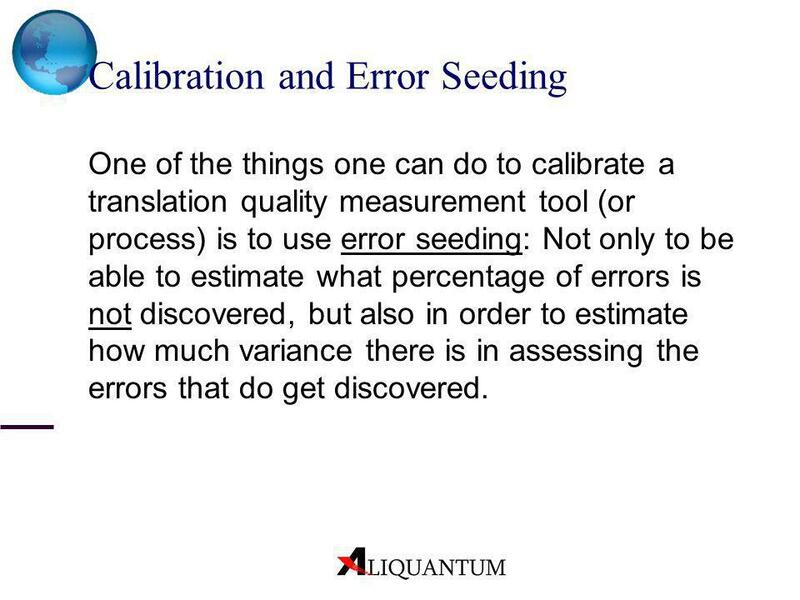 Calibration and Error seeding One of the things one can do to calibrate a translation quality measurement tool (or process) is to use error seeding: Not only to be able to estimate what percentage of errors is not discovered, but also in order to estimate how much variance there is in assessing the errors that do get discovered. 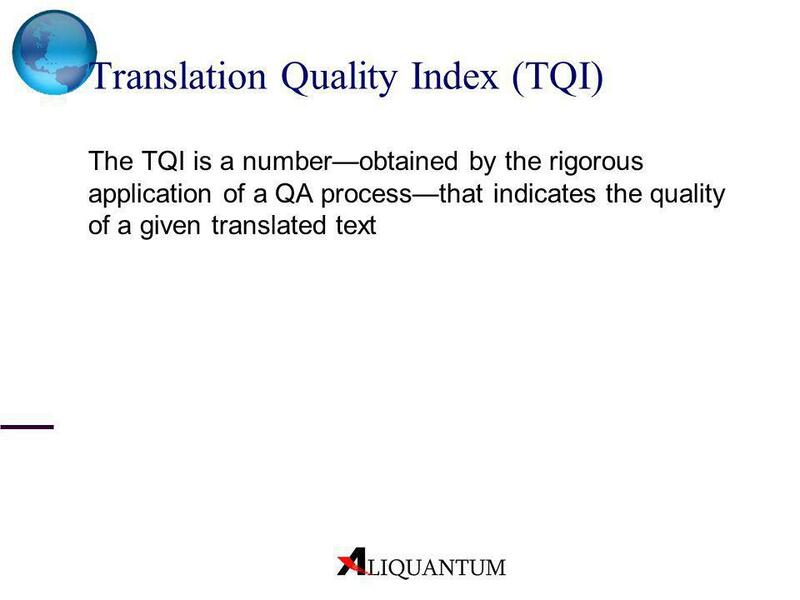 The TQI is a number—obtained by the rigorous application of a QA process—that indicates the quality of a given translated text The TQI shouldn’t pass judgment on whether a translation is a pass or fail, right or wrong, correct or incorrect, good or bad. 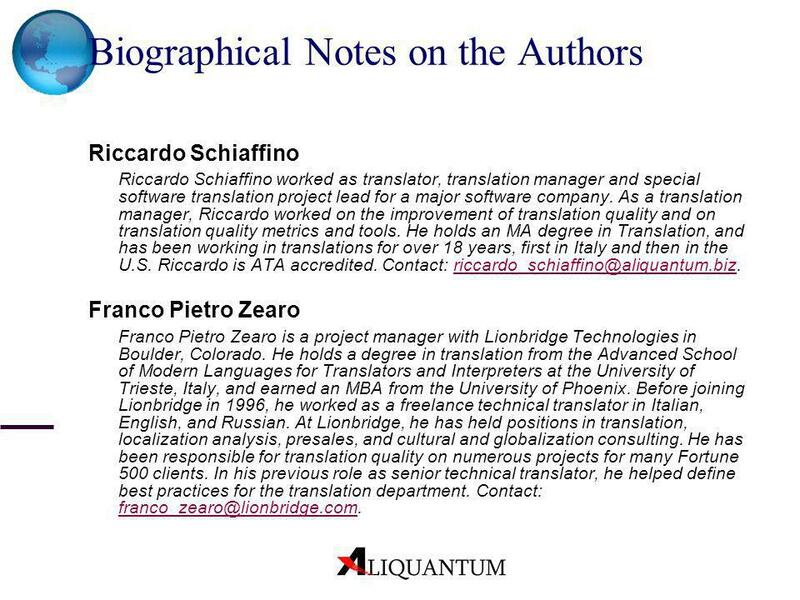 The client and the translator need to reach this agreement. 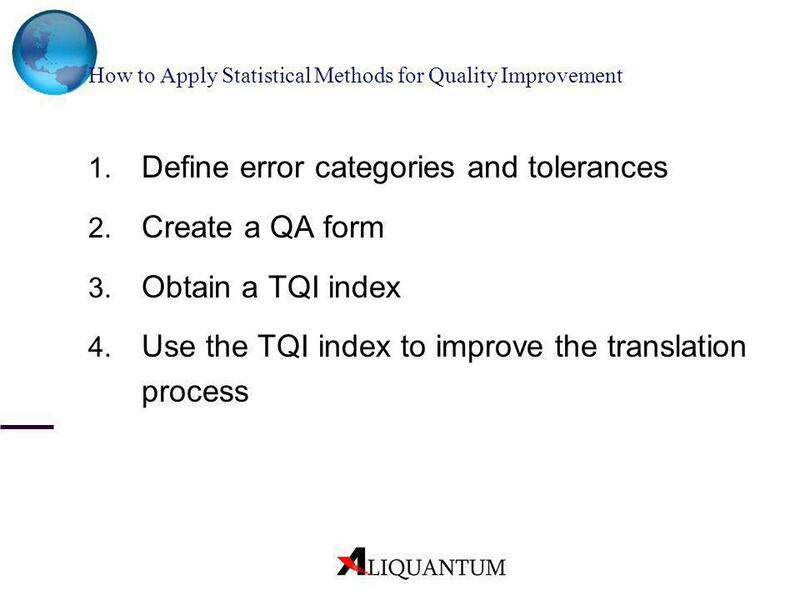 The TQI simply measures on a scale from 0 to 100. 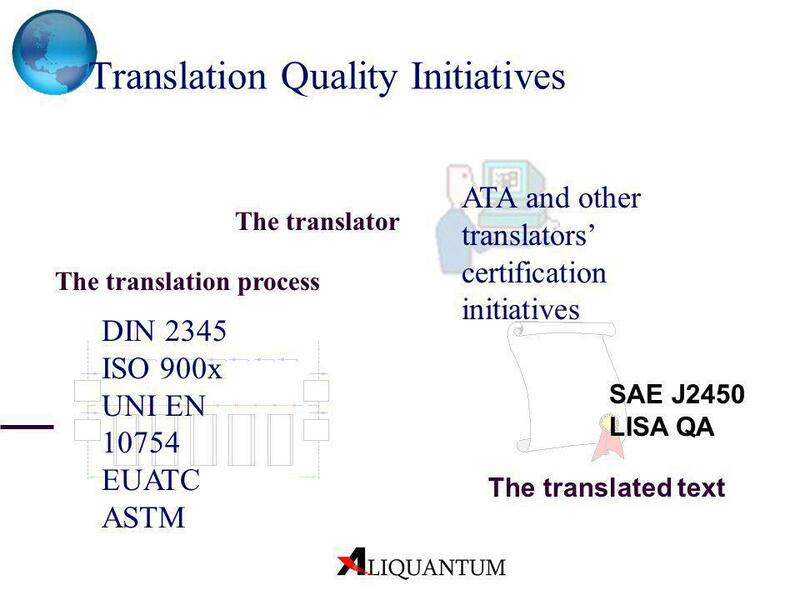 Translation Quality Index (TQI) A number—obtained by the rigorous application of a QA form—that is indicative of the quality of a given translation Our own definition One previous attempts of assigning a translation quality index has been made by the SAE J2450 standard: The concept of translation quality score (TQS). 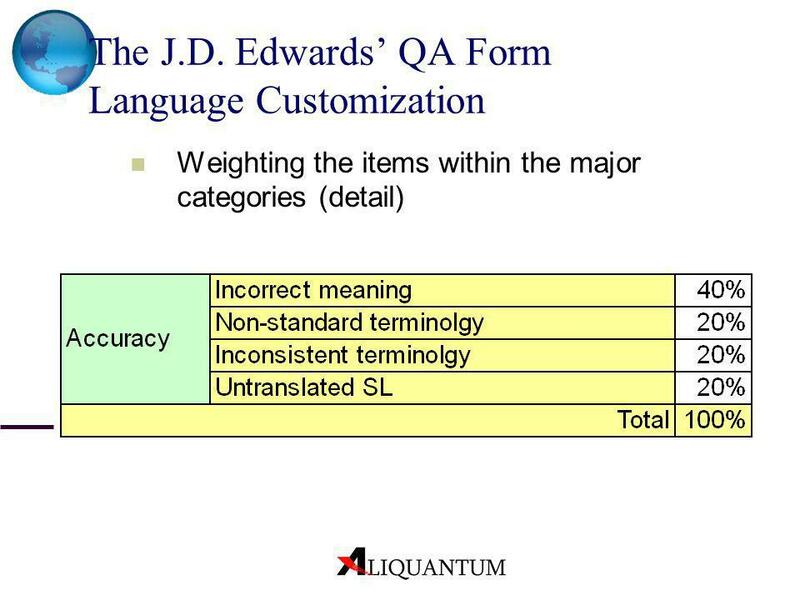 See Woyde, R.: “Introduction to the SAE J2450 Translation Quality Metric” in Language International Vol. 13 No. 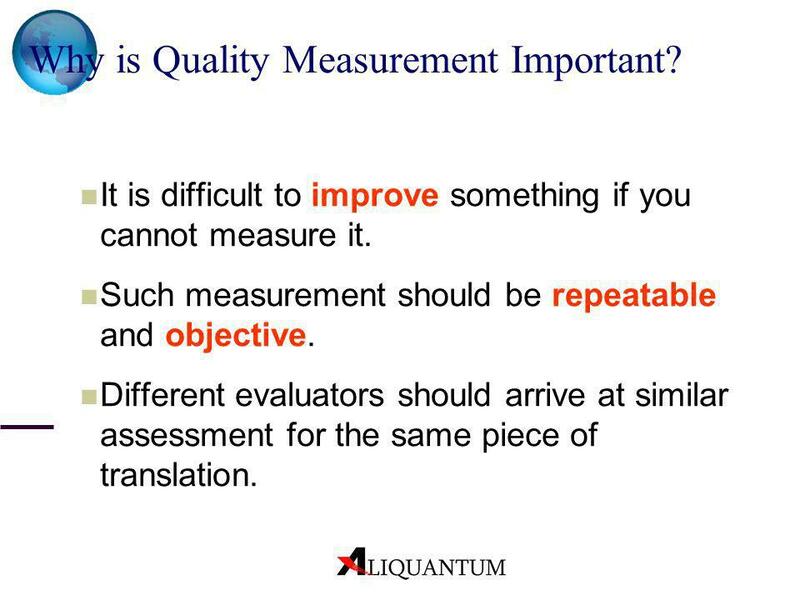 2, April 2001 Indication, not measurement: We know that there are subjective elements of translation quality that cannot be measured, but—by focusing our attention on those that can be objectively measured—we believe we can obtain a useful indication of translation quality. 67 Index / Indices Depending on one’s purpose, there may be more than a single TQI. 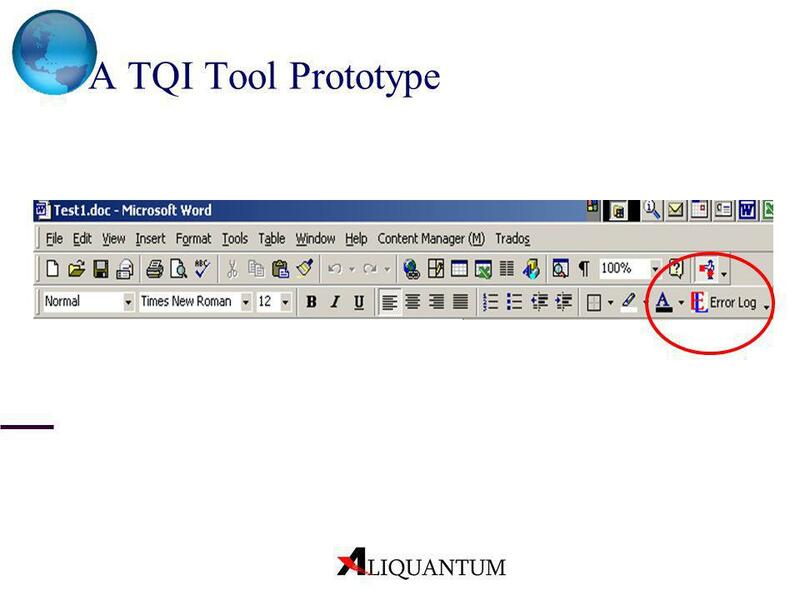 E.g., a TQI may be developed for external purposes (to standardize the work obtained from outsourcing). 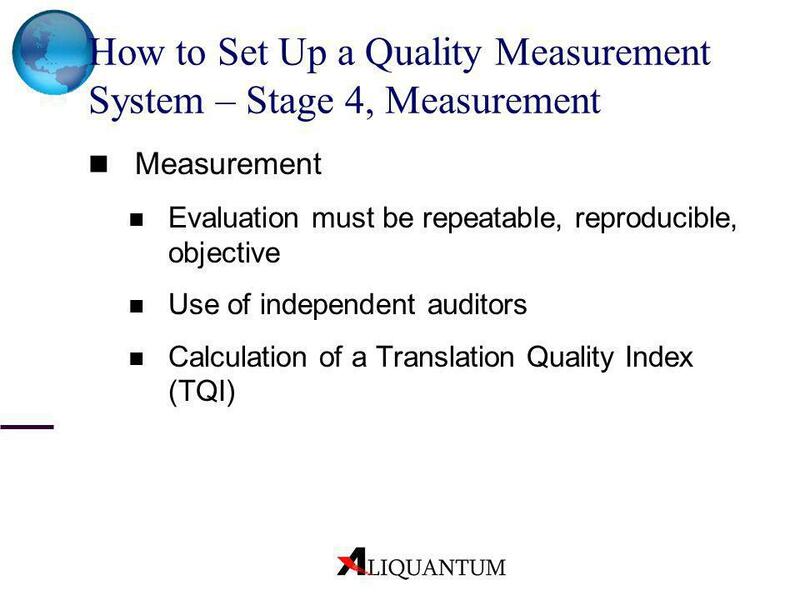 Another TQI may be primarily for internal purposes (to measure the quality of a given special process). 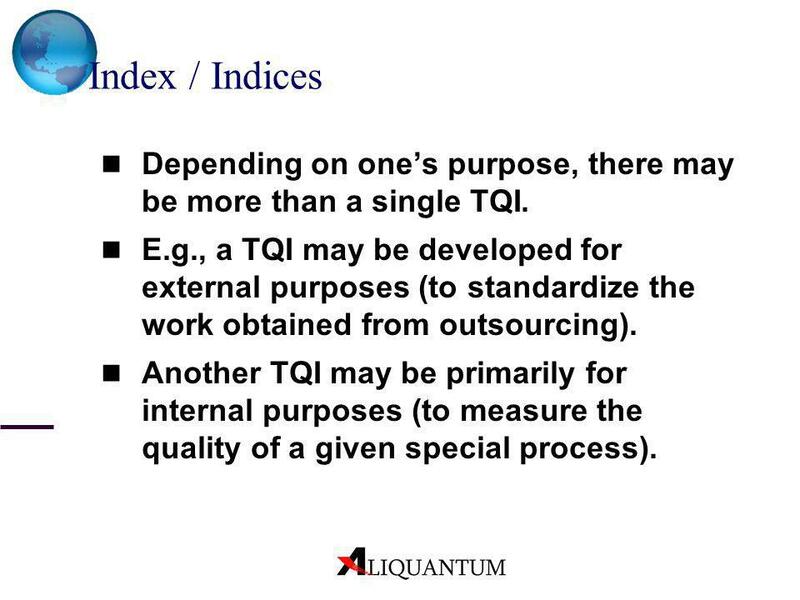 Depending on one’s purpose, there may be one than a single TQI; for example, a TQI may be developed for external purposes (to standardize the work obtained from outsourcing) while another TQI may be primarily for internal purposes (to measure the quality of a given special process). LISA QA Model ver. 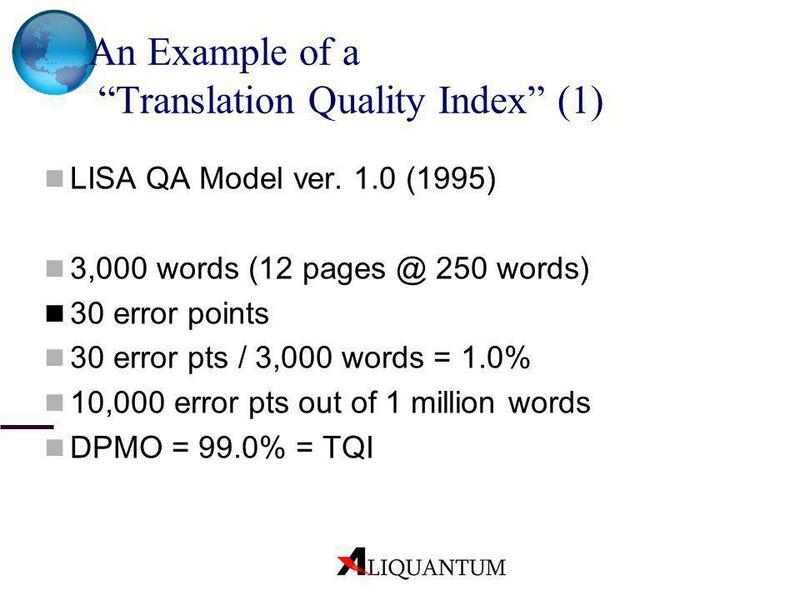 1.0 (1995) 3,000 words ( words) 30 error points 30 error pts / 3,000 words = 1.0% 10,000 error pts out of 1 million words DPMO = 99.0% = TQI (Franco) DPMO = Defects per Million of Opportunities Six Sigma: DPMO = 3.4 (3.4 defects per 1 million opportunities) Opportunities [for defects / errors / nonconformities]: Words, or perhaps translation units, since translation deals with concepts, rather than single words. (But words are easier to calculate). 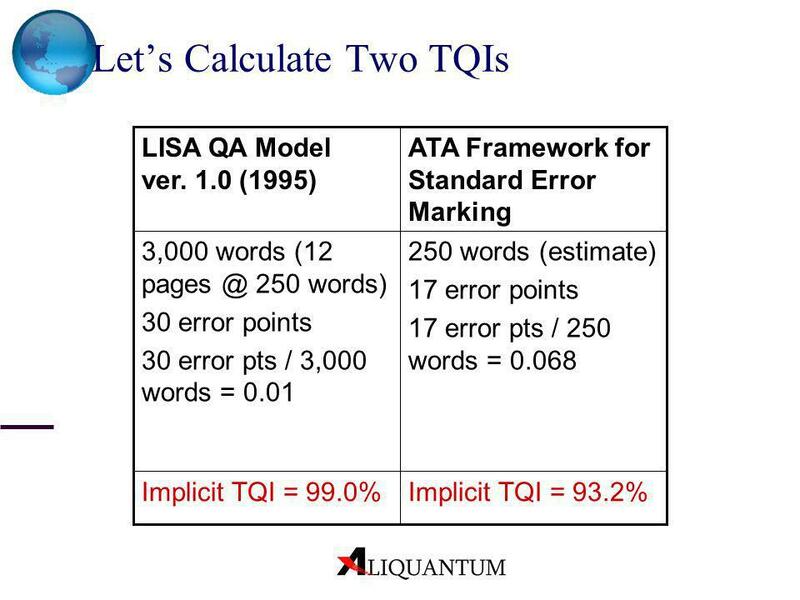 2,000 words (8 250 words) 1 critical error 2 major errors 3 minor errors 6 errors / 2,000 words = 0.3% 3,000 errors out of 1 million words DPMO = 99.7% = TQI (Franco) Be careful when comparing TQIs from different companies. 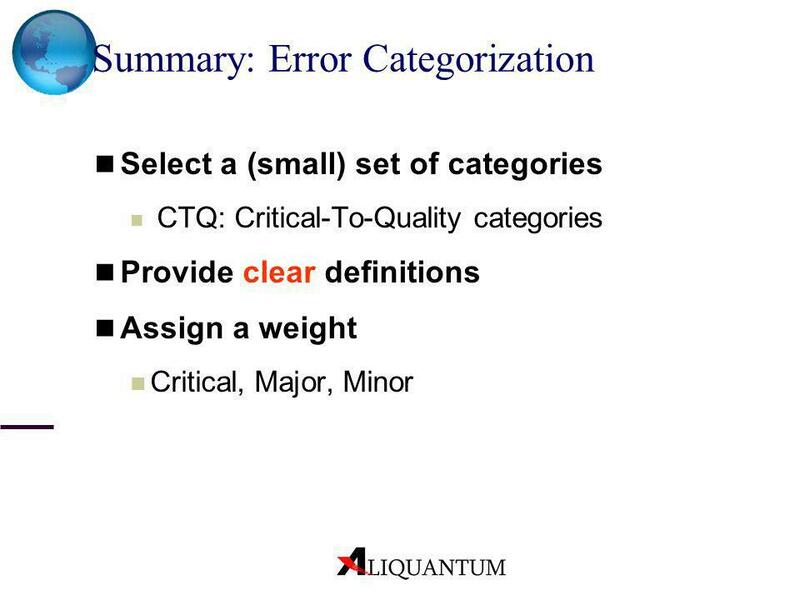 Unless the error categories and weights are the same, it makes no sense to compare different systems. 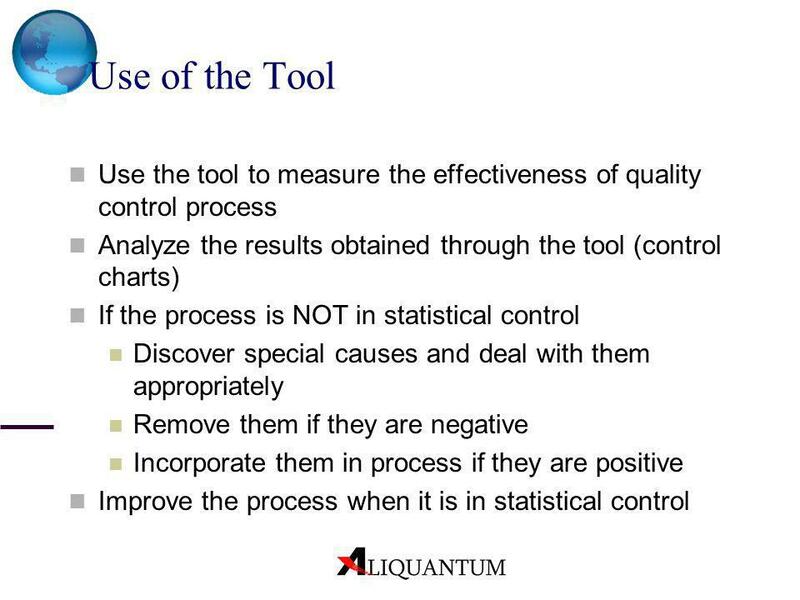 Concept: The process needs to be in statistical control before it makes sense to make improvements Statistical control: Said of a process whose average behavior can be foreseen. 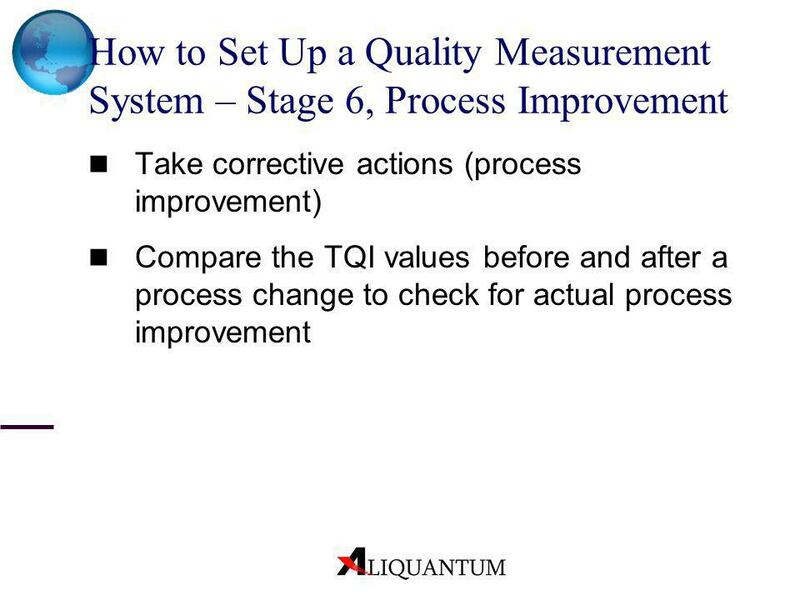 Quote: “Insanity is doing the same thing and expecting different results” (Deming’s course – Dr. Deming was one of the pioneer and of the foremost experts on statistical quality assurance techniques) Obtaining a measurement such as the TQI permits to verify the outcome of a process and see if it is in statistical control. 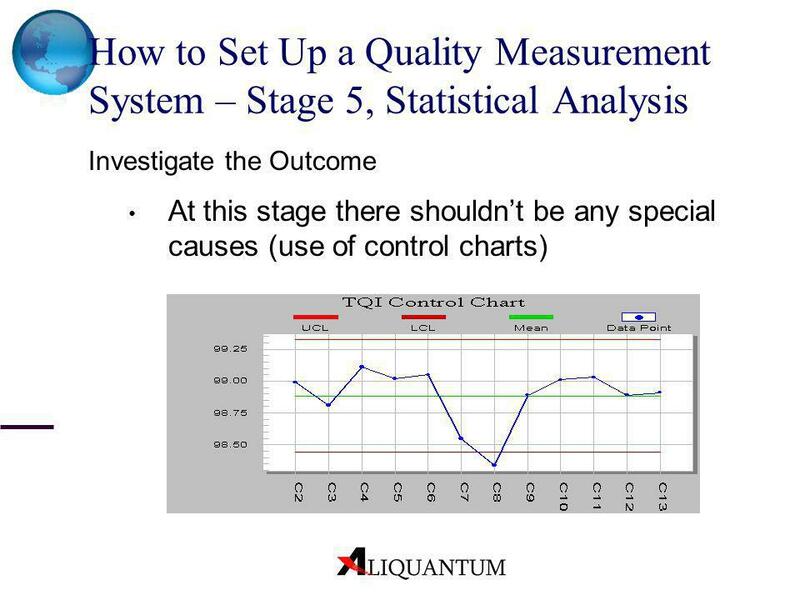 Once it has been determined that a process is in statistical control (i.e., that no special causes are present), we can work to improve the process to reduce its variability and raise the quality level of the system. Special cause: Causes specific to some ephemeral event that can usually be discovered and removed. 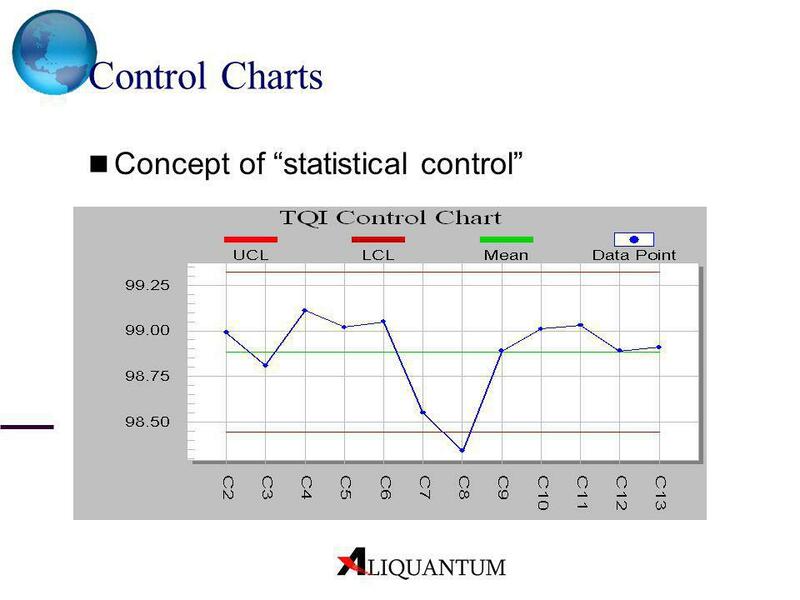 The performance of a system in statistical control, can only be improved by improving the system or the process itself. 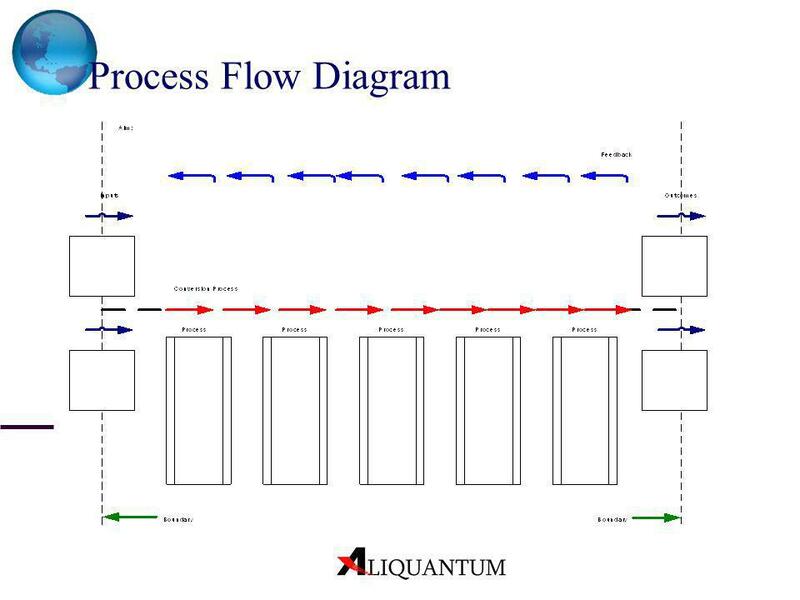 Improving the process improves the quality. 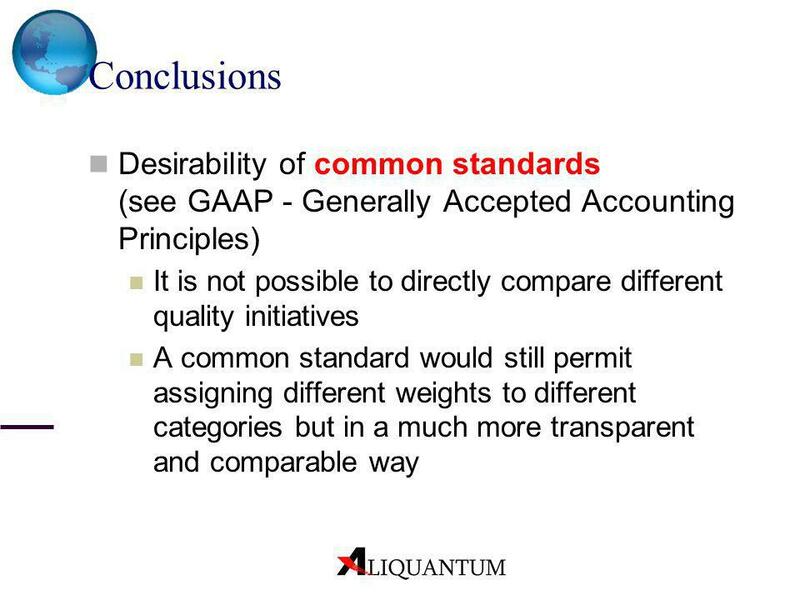 86 Conclusions Desirability of common standards (see GAAP - Generally Accepted Accounting Principles) It is not possible to directly compare different quality initiatives A common standard would still permit assigning different weights to different categories but in a much more transparent and comparable way Different quality initiatives (e.g., ATA, LISA, SAE, etc.) cannot be compared Reasons for differences is probably due the different aims of the different organizations. 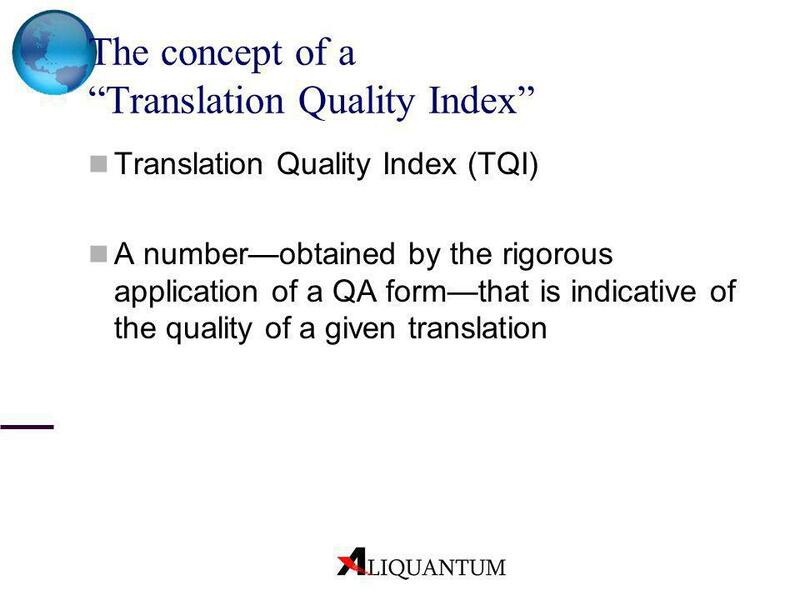 Quality Continuum The TQI is a number—obtained by the rigorous application of a QA form—that is indicative of the quality of a given translation Note: E instead of F The TQI shouldn’t pass judgment on whether a translation is a pass or fail, right or wrong, correct or incorrect, good or bad. The client and the translator need to reach this agreement. 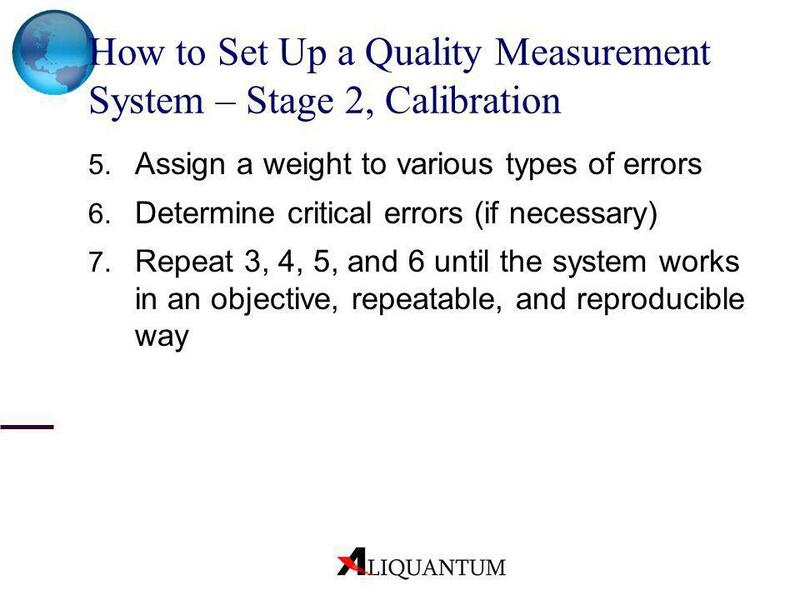 The TQI simply measures on a scale from 0 to 100. 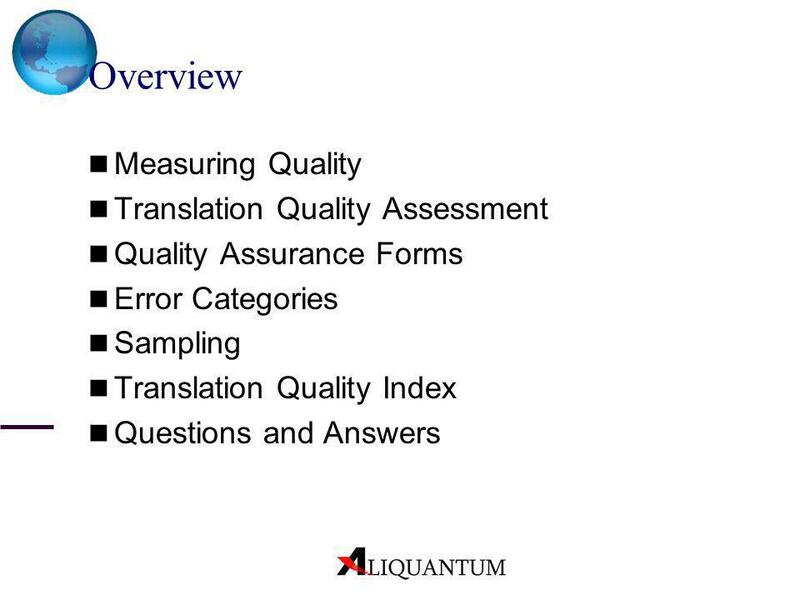 Download ppt "Translation Quality Measurement"
DSS Decision Support System Tutorial: An Instructional Tool for Using the DSS. 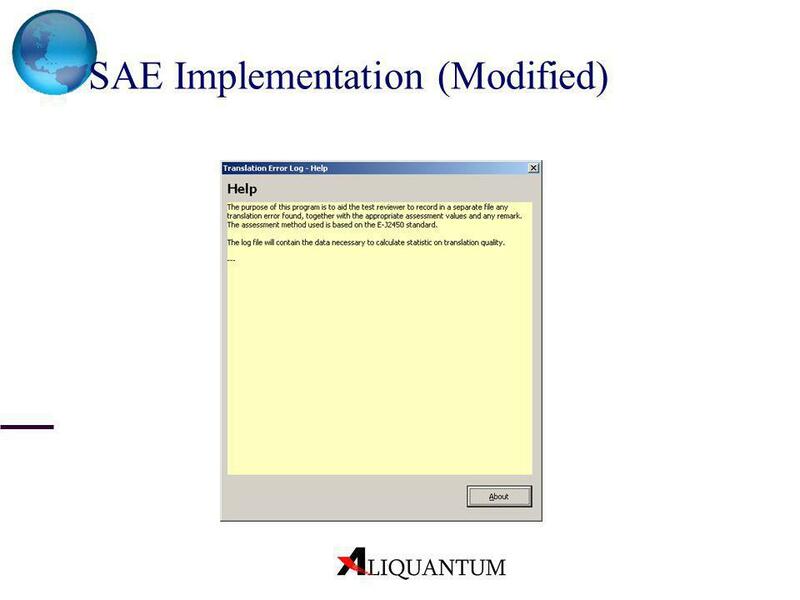  Acceptance testing is a user-run test that demonstrates the application’s ability to meet the original business objectives and system requirements and. 12–1. 12–2 Chapter Twelve Copyright © 2014 by The McGraw-Hill Companies, Inc. All rights reserved. McGraw-Hill/Irwin. 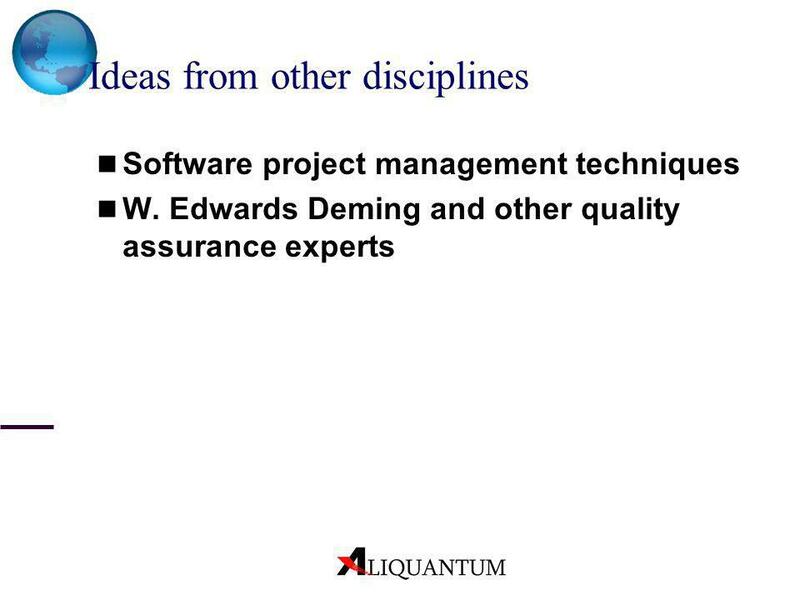 Copyright © 1994 Carnegie Mellon University Disciplined Software Engineering - Lecture 1 1 Disciplined Software Engineering Lecture #7 Software Engineering. Updated Force Measurement Statistical Tool Jason Beardsley and Bob Fox.